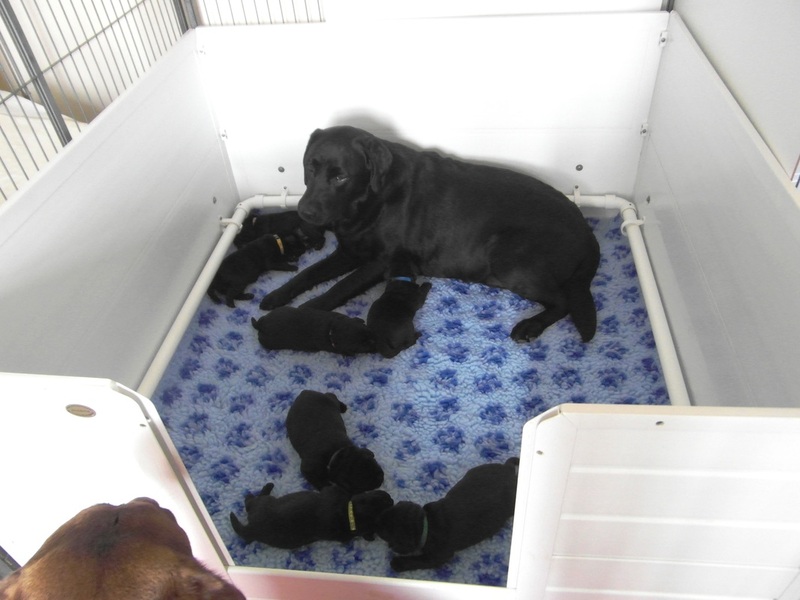 One of the first photos of Annie with her puppies, 4 girls and 3 boys. 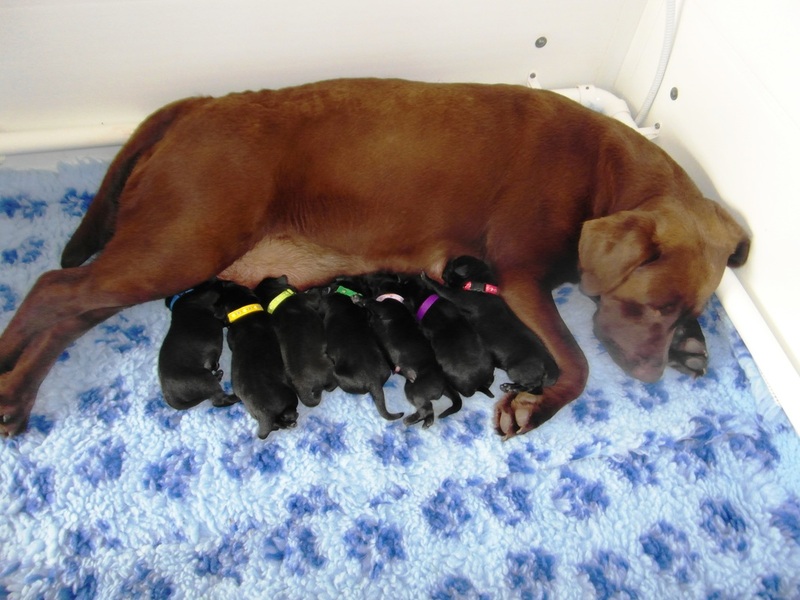 WATCH a short video of Annie and her puppies. 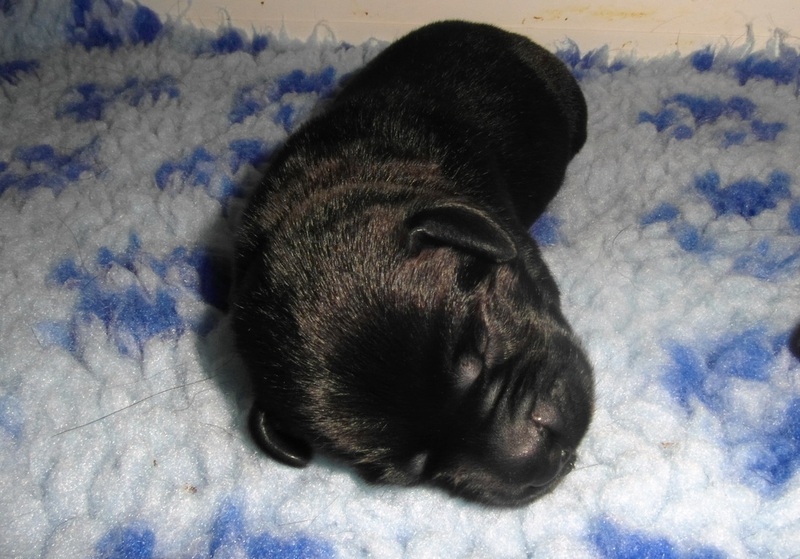 Below are a few photos taken today, click on each thumbnail to see the larger picture. The boys have the plain collars, the girls have the ones with hearts on. We had rather a sleepless night last night. 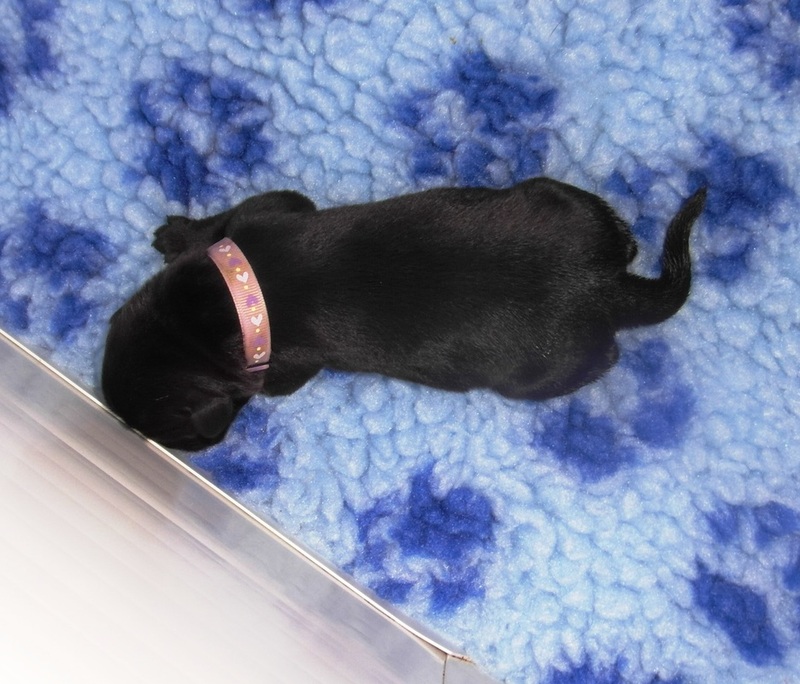 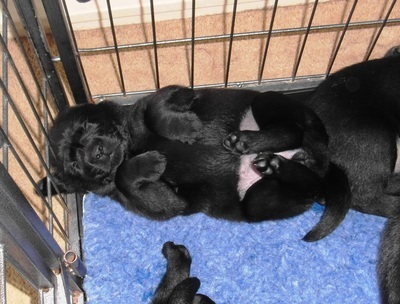 Annie is quite a tidy little soul and likes her puppies in the correct place. This often means moving them around the whelping box, sometimes by a gentle nudge of her nose, sometimes by a gentle shove of her foot and sometimes by picking up a puppy in her mouth and carrying it gently to where she wants it. You can watch her HERE moving them around. A few more photos of the puppies, taken today. 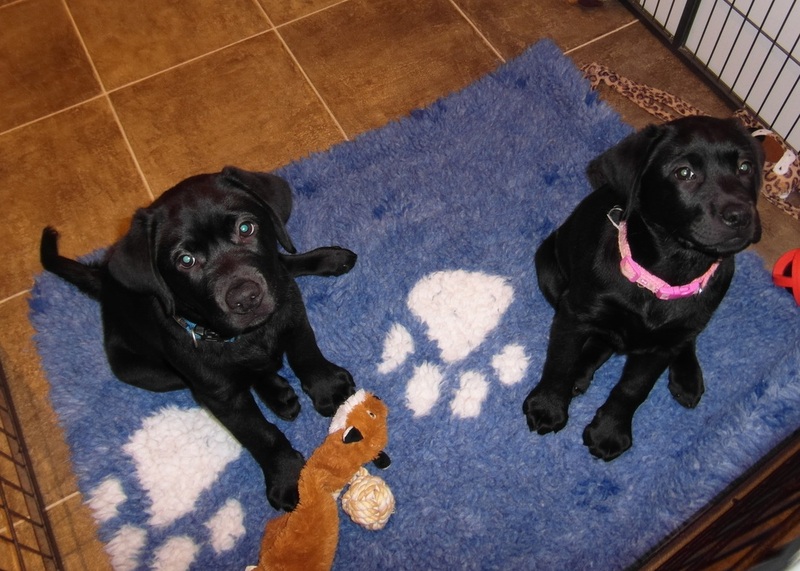 They had their nails trimmed after these photos were taken, it's amazing how quickly they grow. 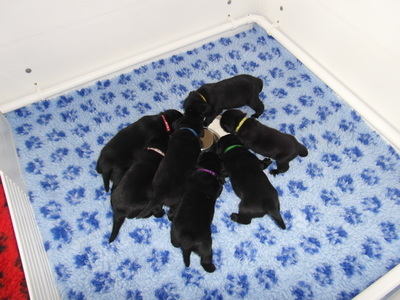 It's important to keep them trimmed so that they don't damage Annie during feeding time. 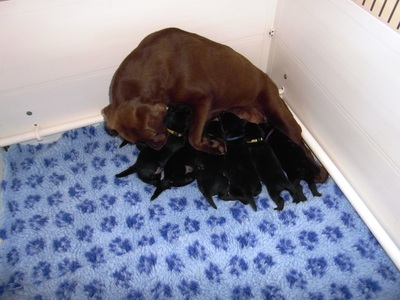 Look who sneaked in to give the puppies a quick wash, Granny Martha. 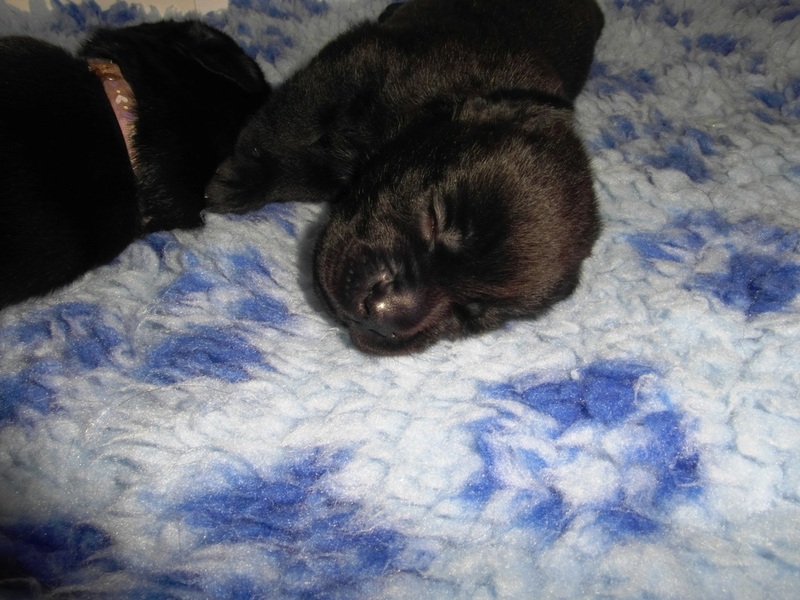 Excuse the spots of blood on this photo, Annie had had a nose bleed of all things. Look how cute those 2 girls are, lined up together. 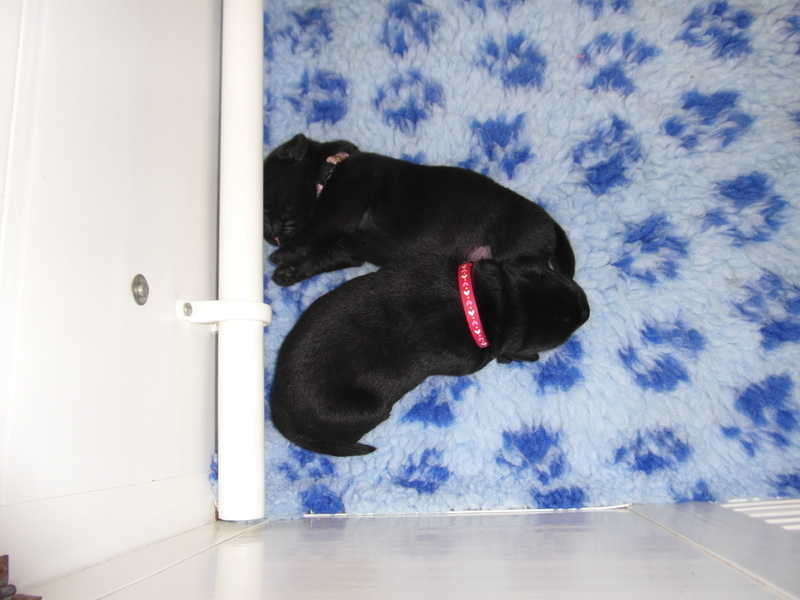 The smallest girl and biggest boy snuggling up together. The rugby scrum at the milkbar. 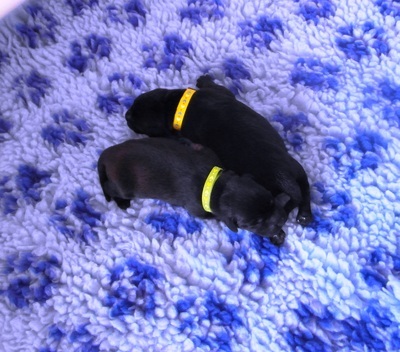 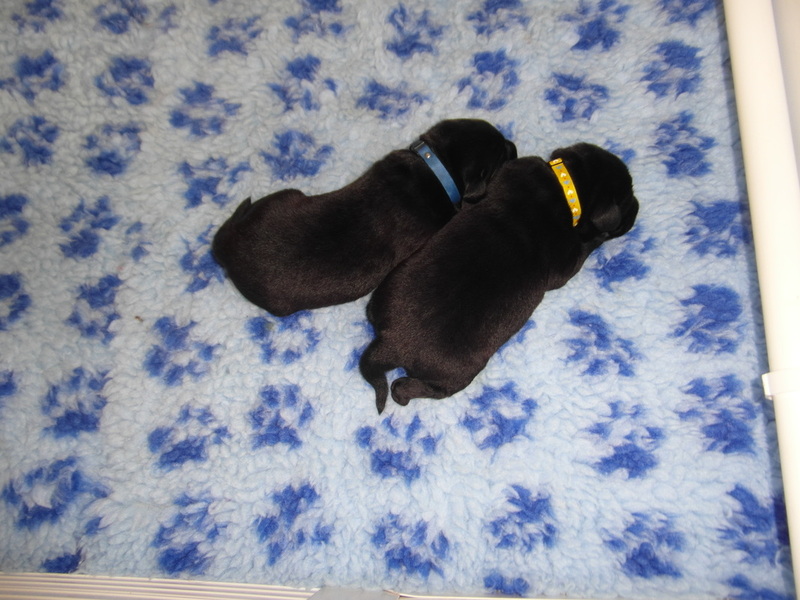 The puppies are a week old today and all except one have almost doubled their birth weight. 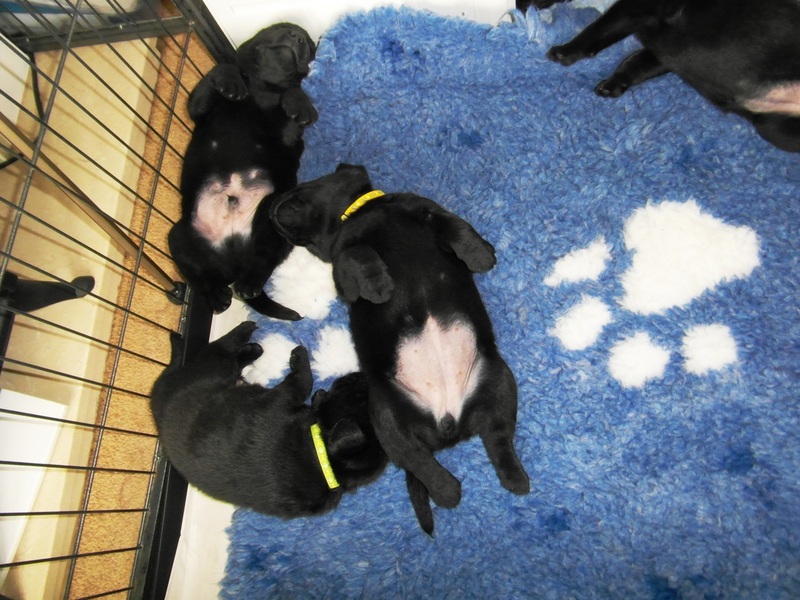 One girl is still quite small but the rest of the puppies are little porkers. 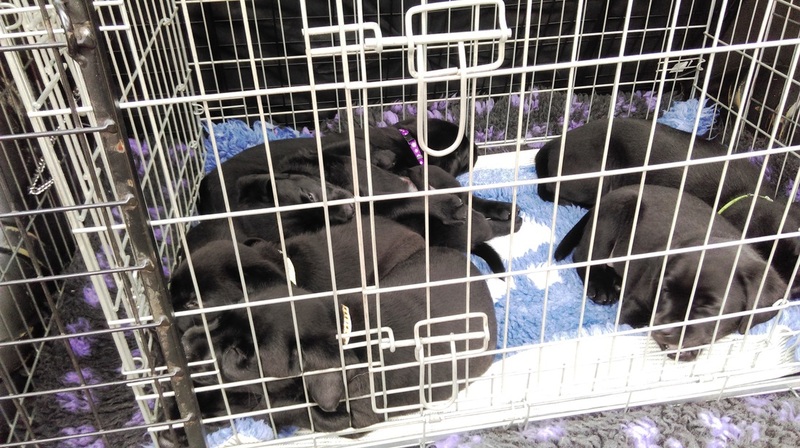 Sometimes the puppies all snuggle up together,but at other times they spread out around the four corners of the whelping box, as you can see in the 4 photos below. 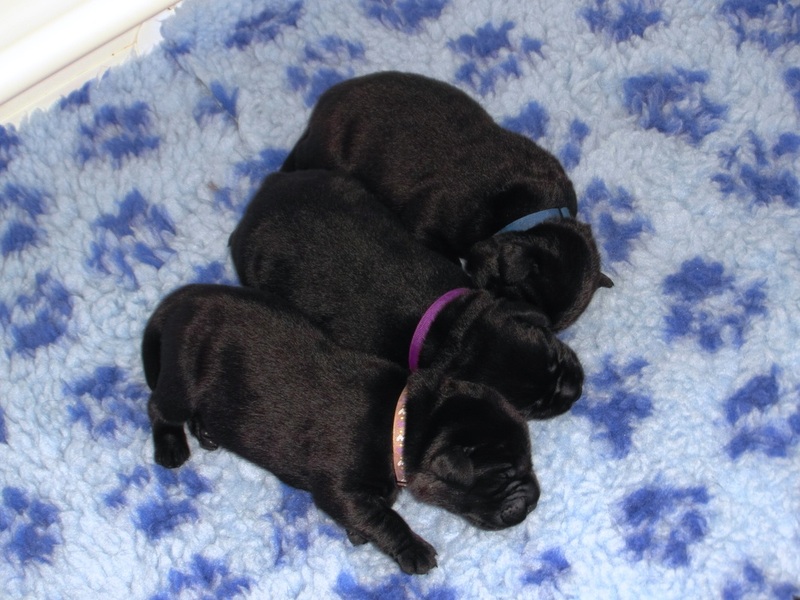 Here they are, snuggled up back together. A couple of photos taken this morning. 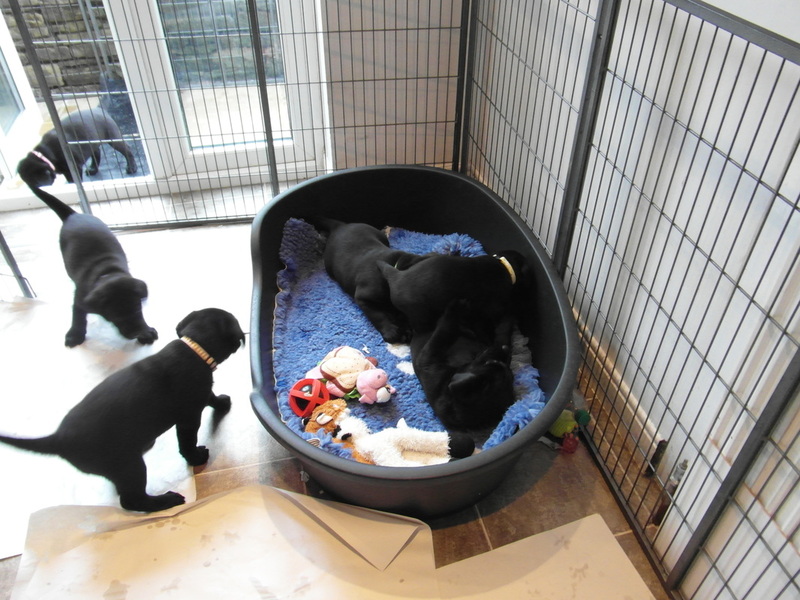 The first one shows Lottie trying to sneak into the whelping box with Annie, with Martha close behind. 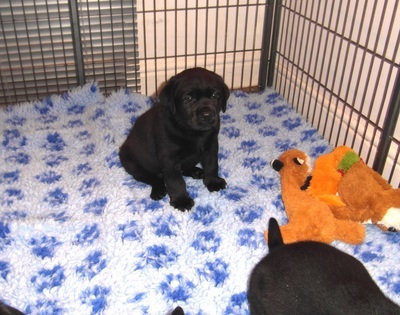 The second one is Lottie actually in the whelping box with Annie, giving the pups a closer inspection. 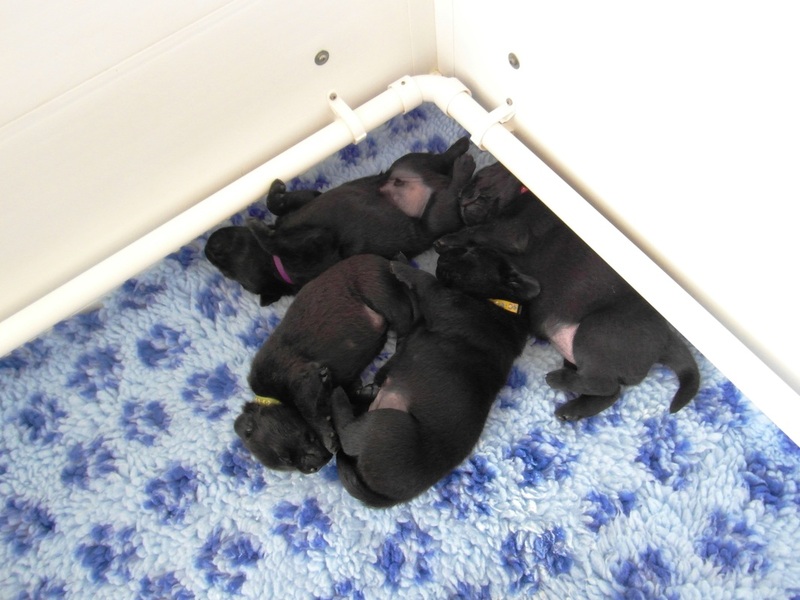 All fast asleep - peace at last. 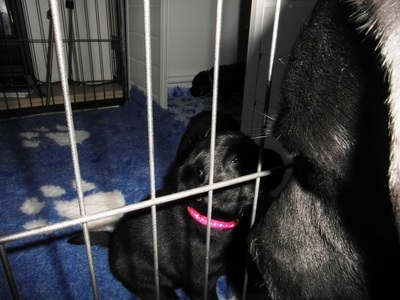 Look who sneaked in with the puppies when our backs were turned, Granny Martha. 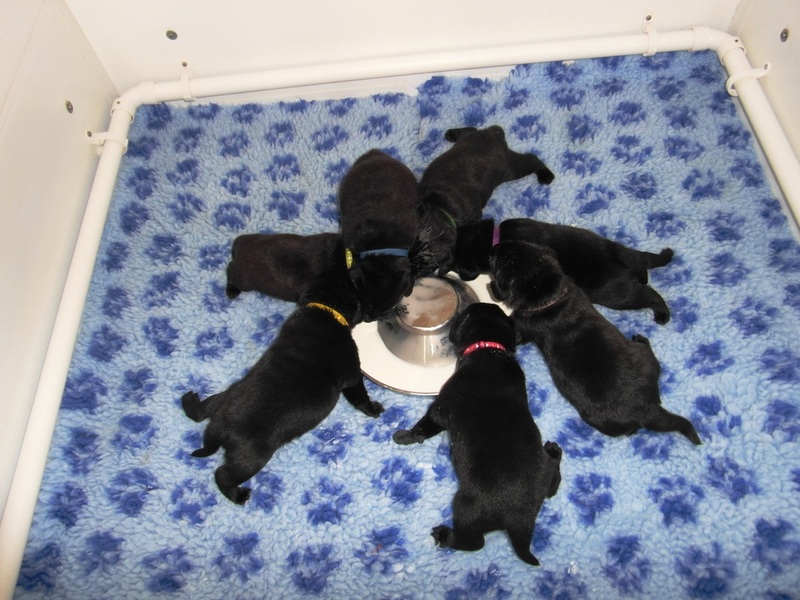 The puppies can be quite vocal when it comes to mealtime. 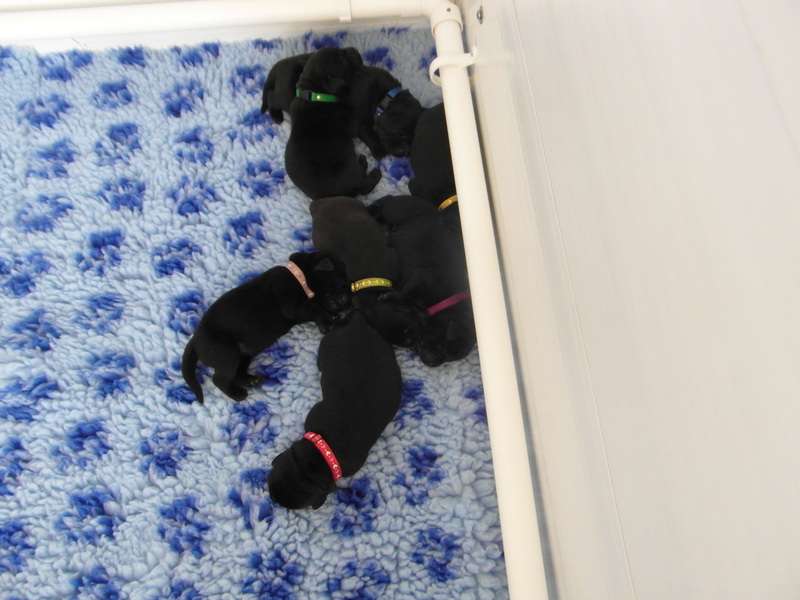 Here's a VIDEO of them heading to the milkbar. 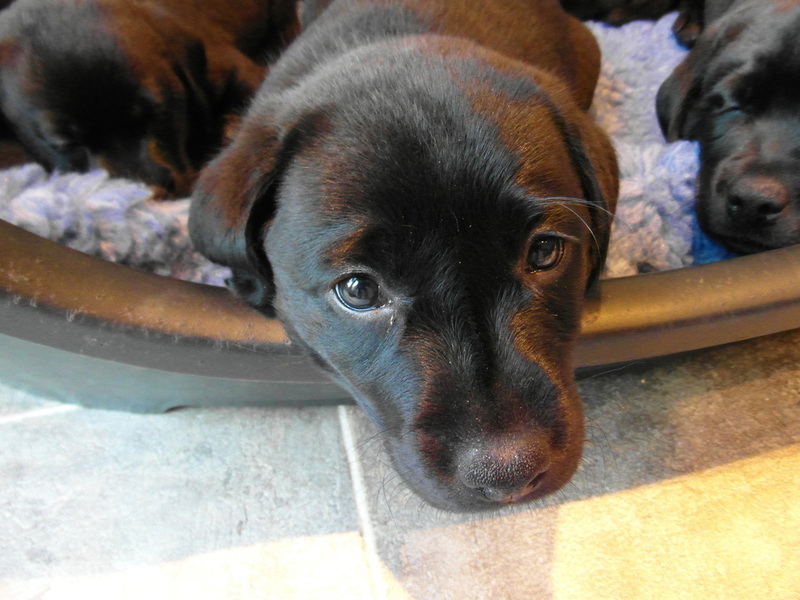 One of the loveliest moments is when you lift up a puppy, look at his/her face and there's a pair of eye peeping back at you. 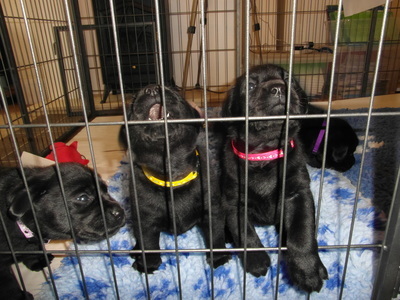 The girl with the yellow collar is the first one to have her eyes open and they were peeping back at me as I lifted her out to trim her nails today. 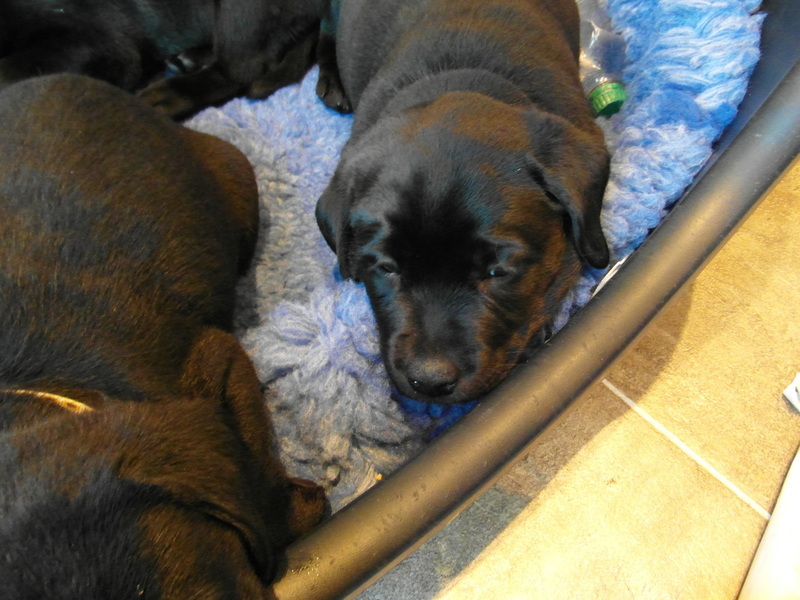 More of the puppies have got their eyes open today, so I need to be particularly careful when using the flash on the camera and make sure they're asleep, so I don't do any harm. 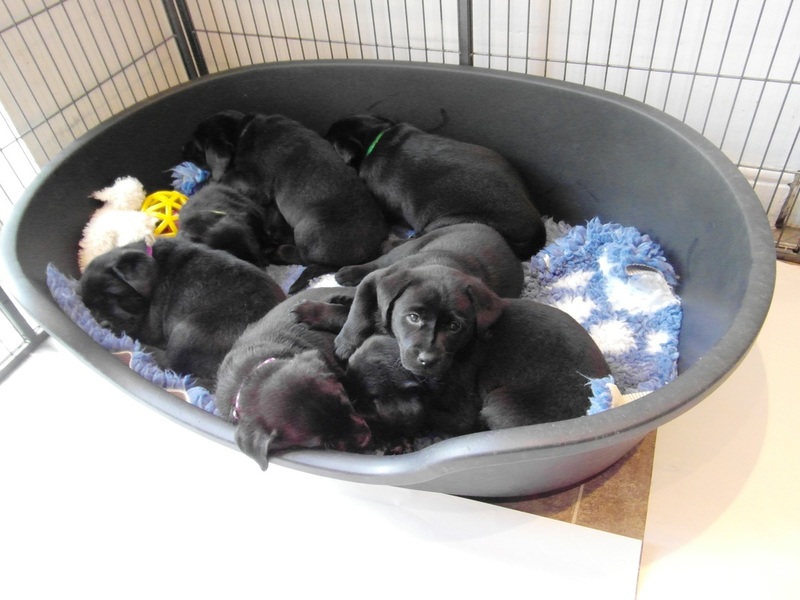 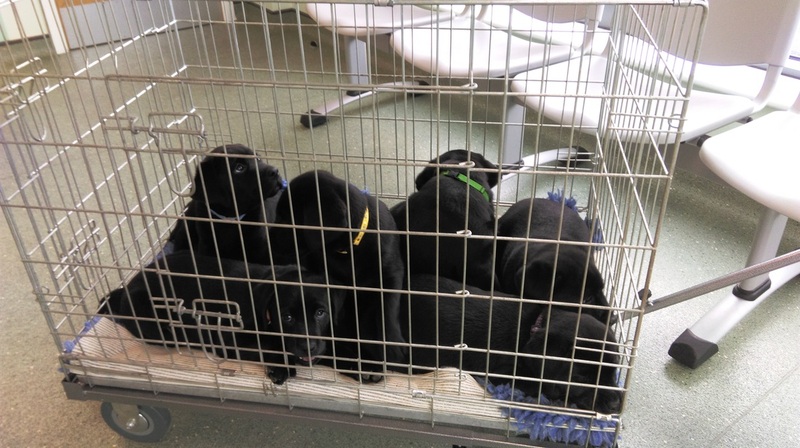 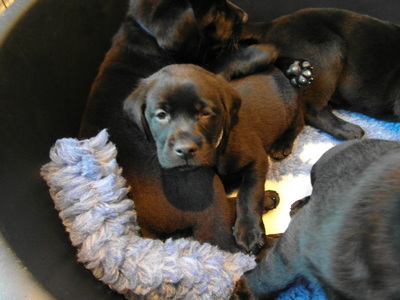 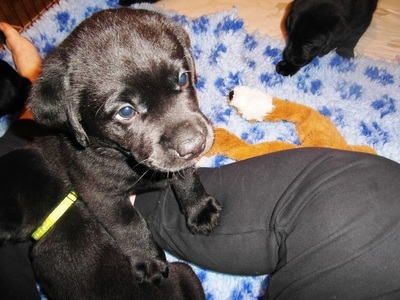 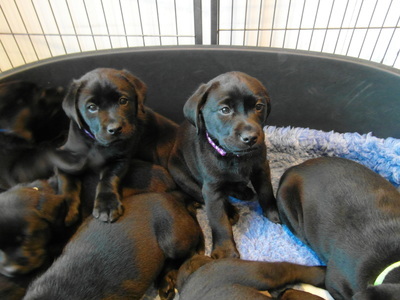 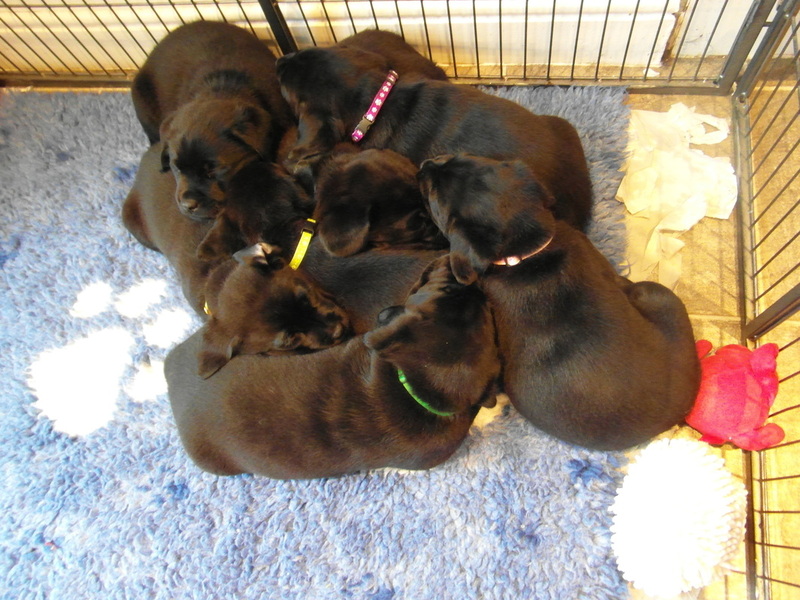 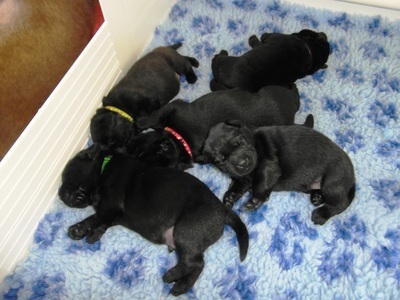 The puppies have had a busy afternoon, with lots of young visitors giving them cuddles. Ciaran, Declan and Archie enjoying puppy cuddles. Luca, looking very happy to have his first cuddles with the puppies, they were only a day old before he went on holiday. 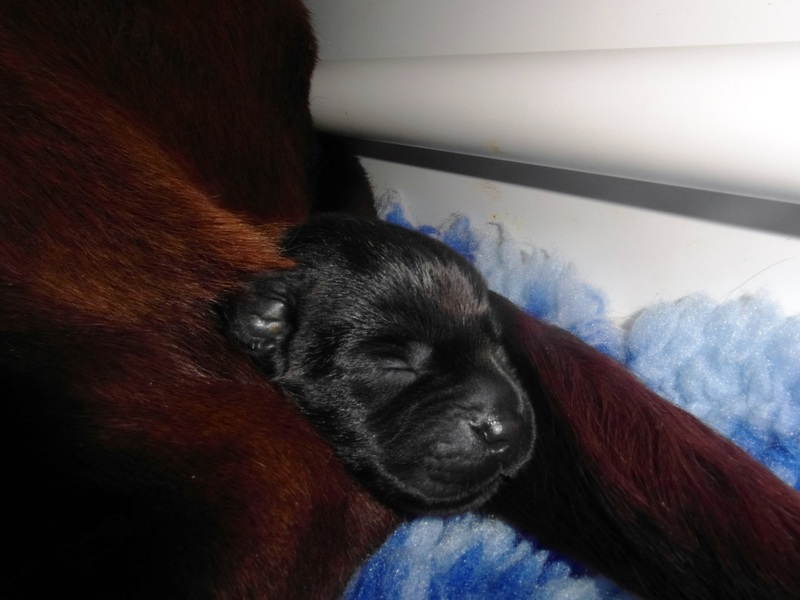 Annie's keeping a close eye on Owen to make sure he's nursing her daughter properly. A few more photos of the puppies, taken today. 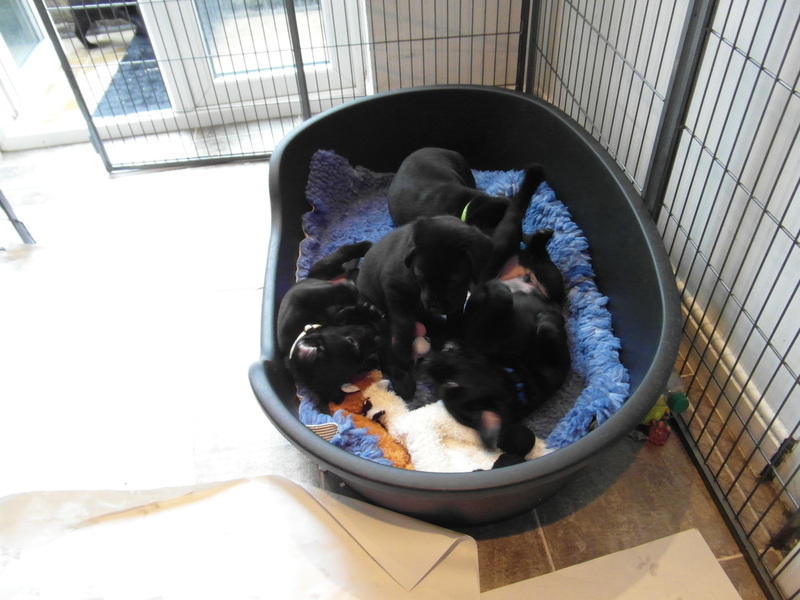 The puppies have had their first taste of goat's milk today. They didn't need any encouragement and soon had it polished off. Brothers make such good pillows. 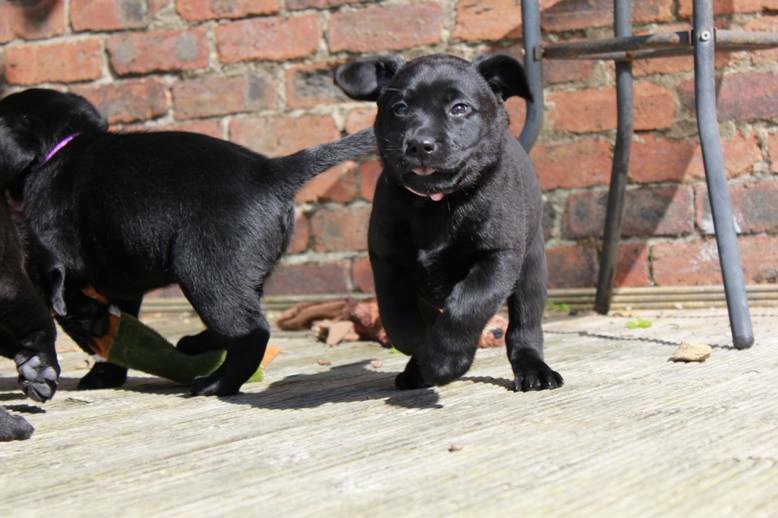 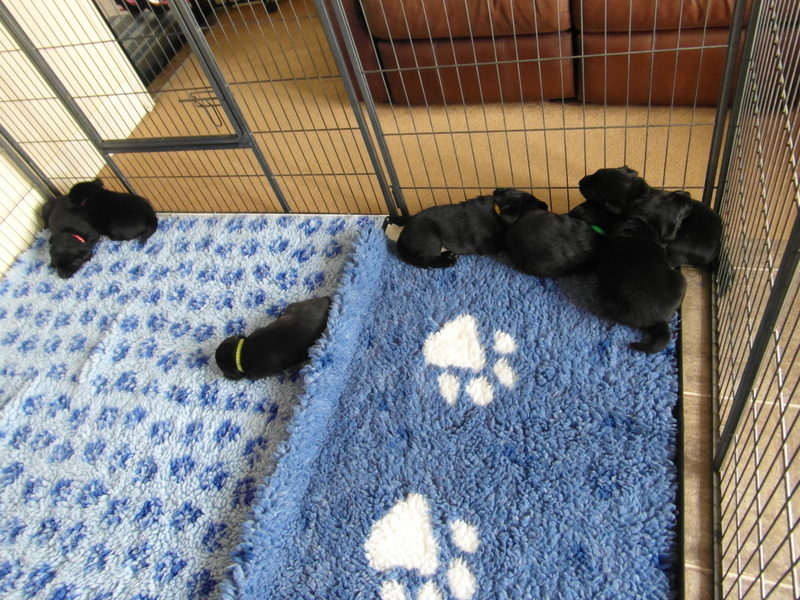 The puppies are up on their feet now, instead of the 'commando' crawl they started off with. 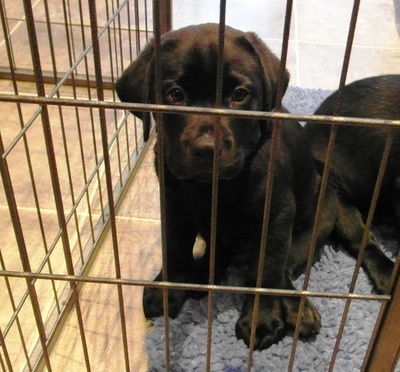 It won't be long before we have the first escapee from the whelping box. It won't be long before the puppies are escaping the whelping box, this little chap was having a good try this morning. Before and after photos - enjoying the goats milk and chilling out with full tummies afterwards. The puppies had a visit from my youngest granddaughter, 2 year old Isla, today. They had lots of cuddles together. 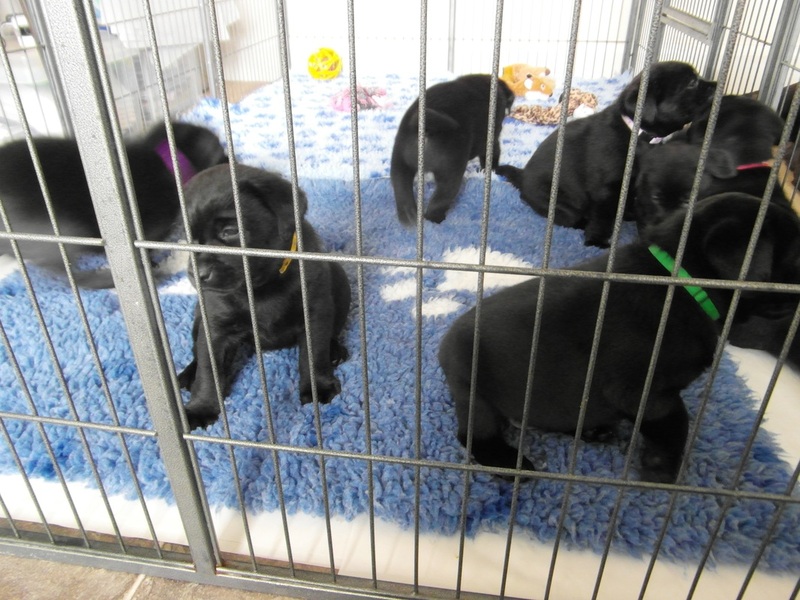 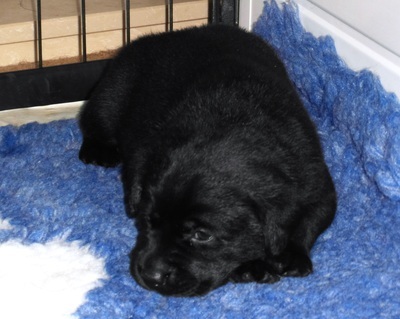 The puppies have had more visitors today, although we didn't get any photos. Great Granny Poppy has kept away from the pups until today. 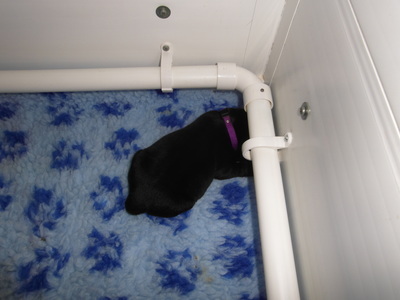 I lifted one out for her to sniff and later on this morning she sneaked into the whelping box and refused to come out. 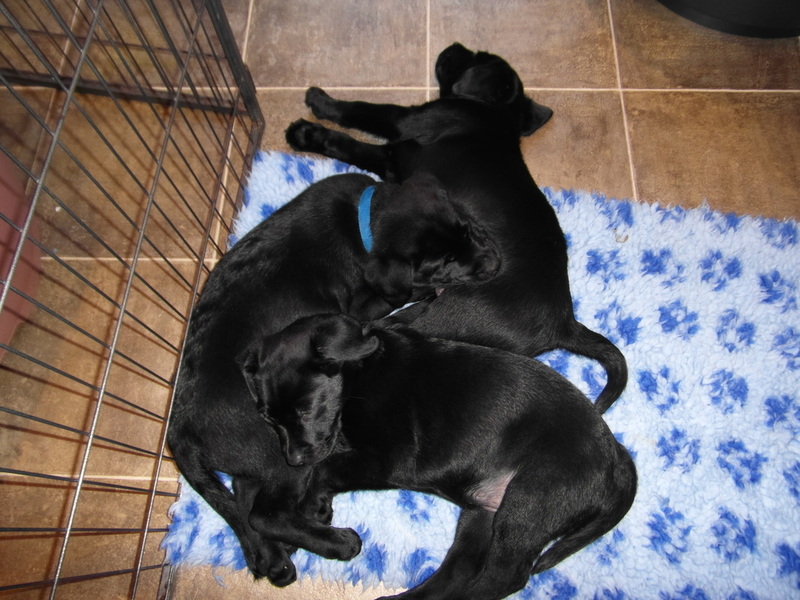 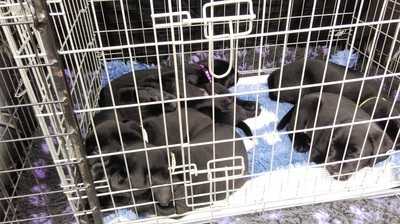 After a busy day the pups are catching up on some well earned sleep. 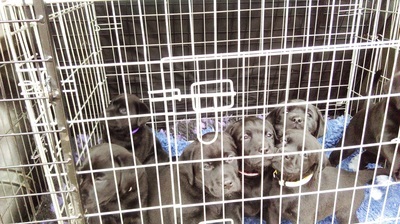 Tomorrow they'll get their first taste of proper food. The puppies have had their very first taste of proper food today. 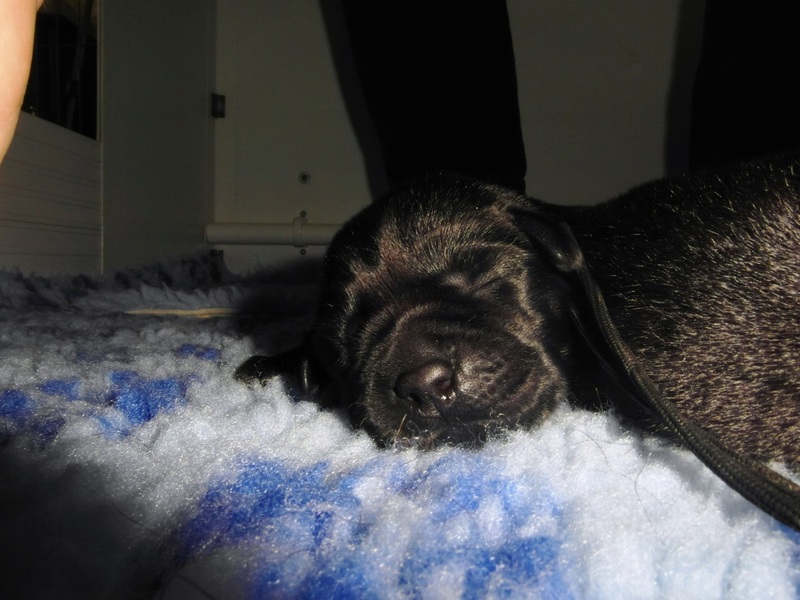 It's puppy kibble soaked in hot water, mushed to a pulp with a little goat's milk added. 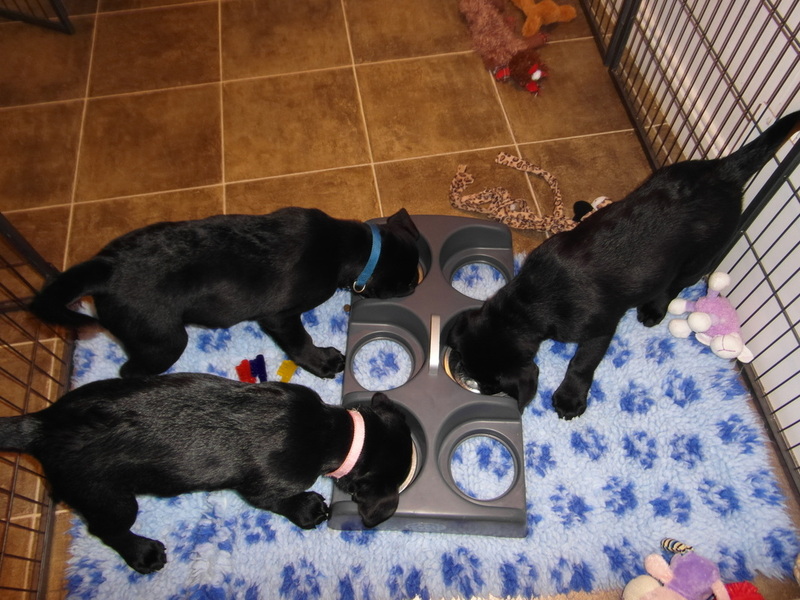 They didn't need any encouragement to tuck into it. Annie very thoughtfully cleared up any excess. 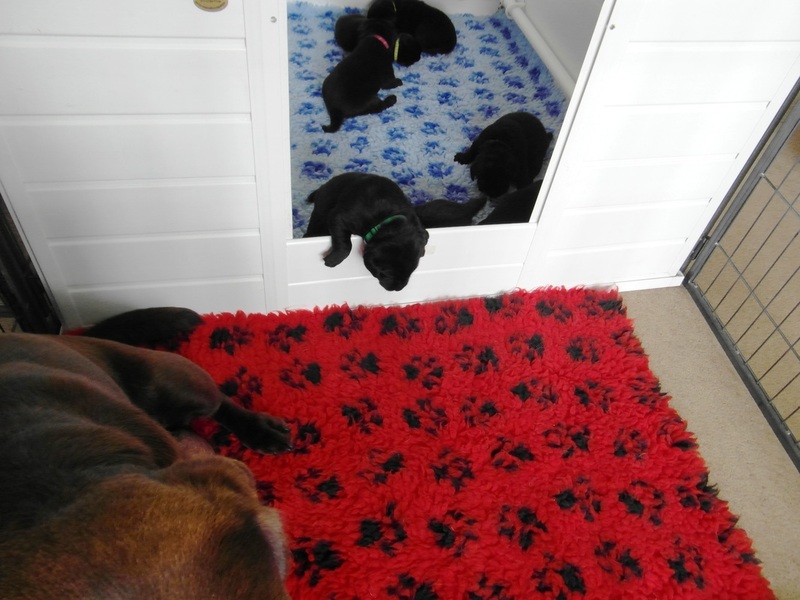 Great Granny Poppy sneaked in with the puppies this afternoon. 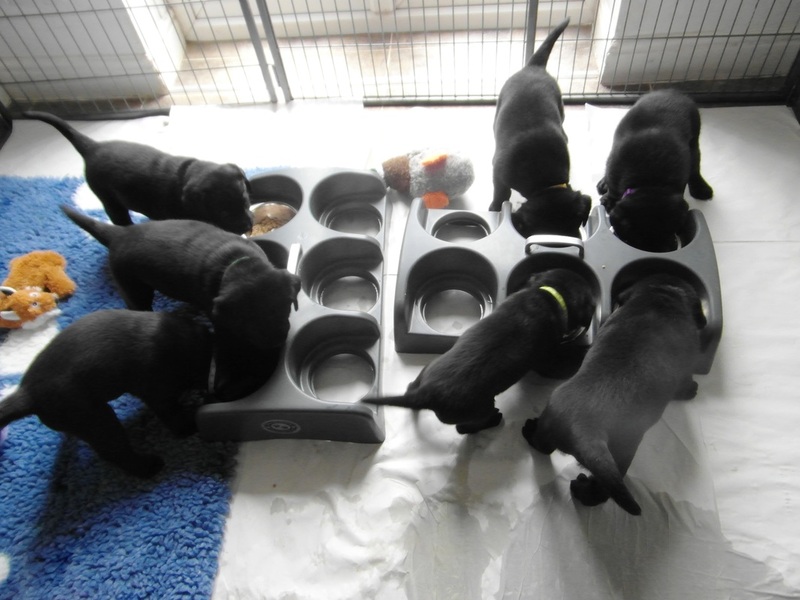 The pups soon realised that that was one milkbar that was dry. 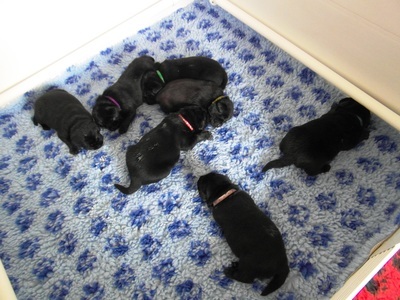 Richard, Zoe and their children came to visit this afternoon. 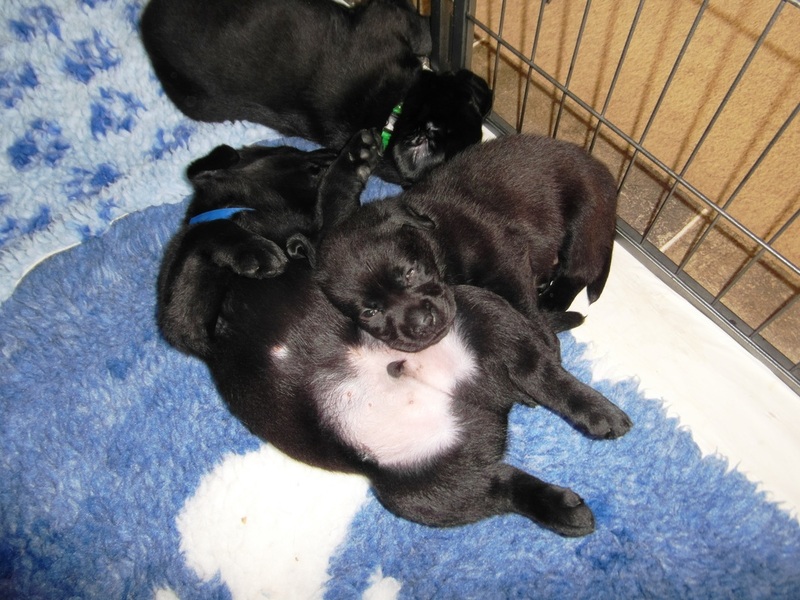 They own Jeffrey, the puppies' sire. 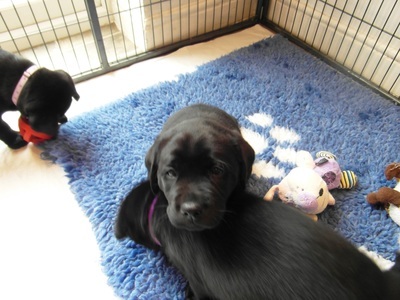 Some children are just naturals when it comes to handling puppies and older dogs and their daughter, Harriet is one of them. 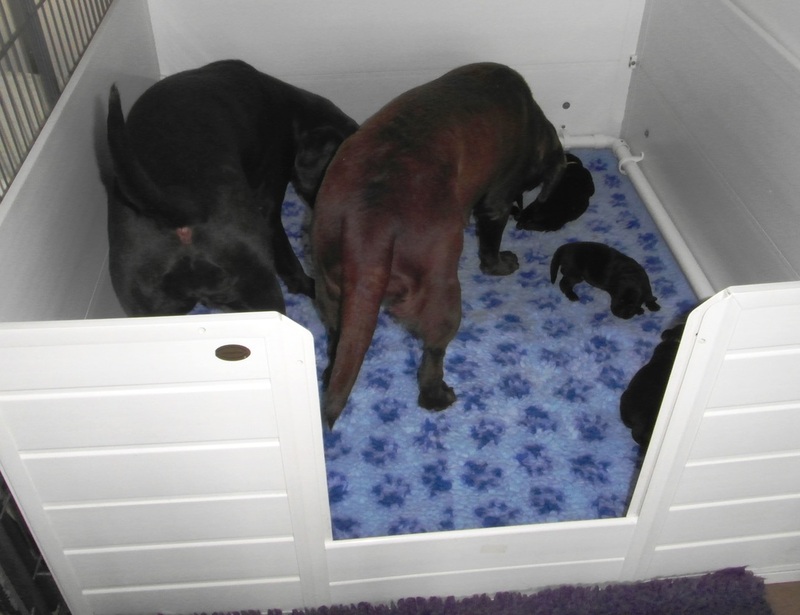 I've taken down the barrier that stopped the puppies getting out of the whelping box and now they can get into the extra part of the pen, where they can see more of what's going on. 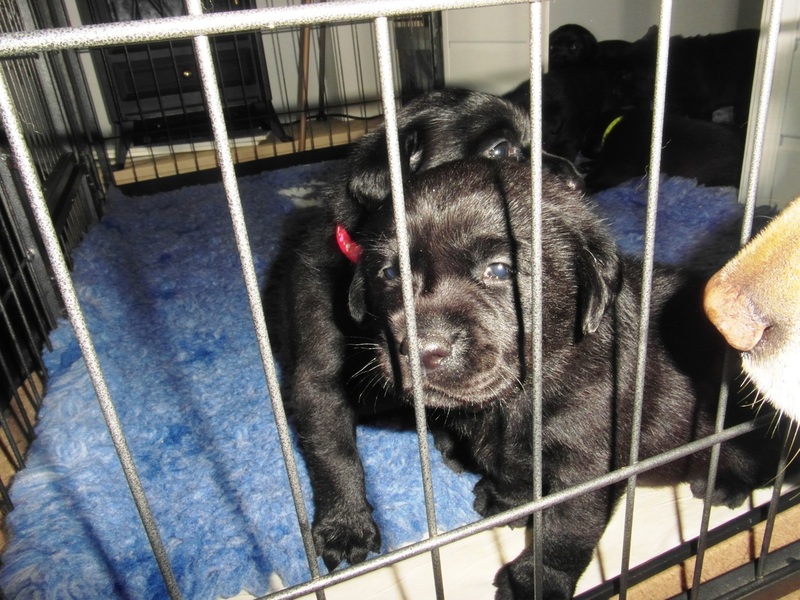 Watch some of them exploring in this VIDEO. 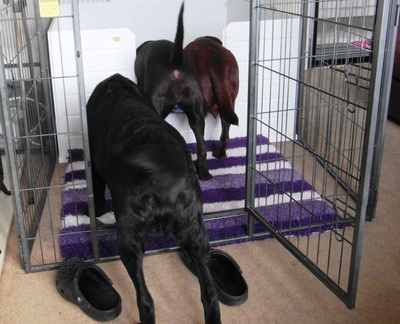 Ned was very interested in them and watched them closely while wagging his tail. 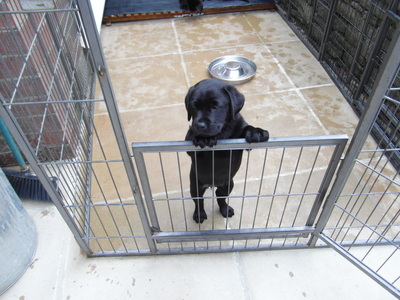 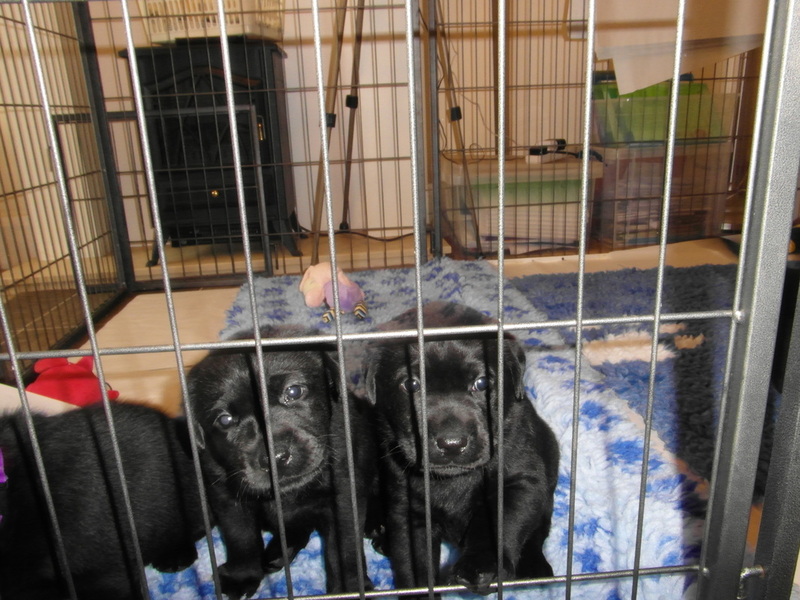 The puppies are enjoying having the extra part of the pen to play in and to be able to see the other dogs. Here are a few of today's photos. 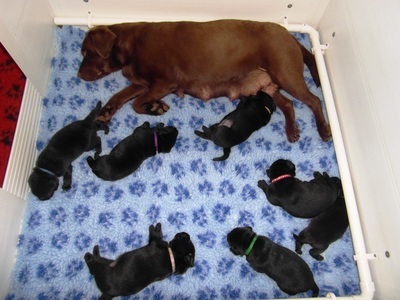 Click on each photo to see the larger version. 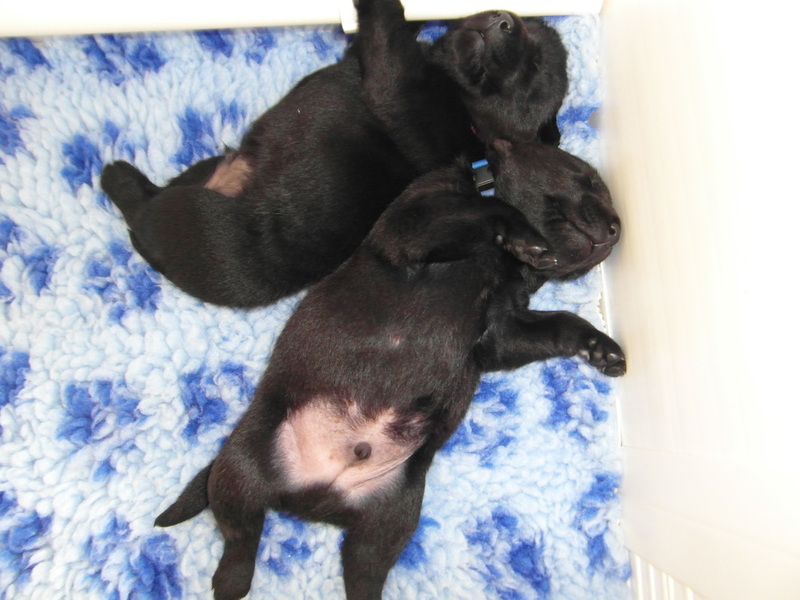 A couple more tummies to blow raspberries on. 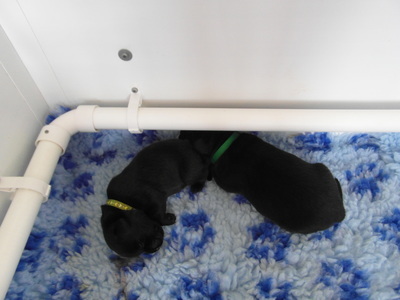 The puppies seemed to spending most of their time outside of the whelping box so I've taken the sides down so they now have a clear view of everything that's happening. 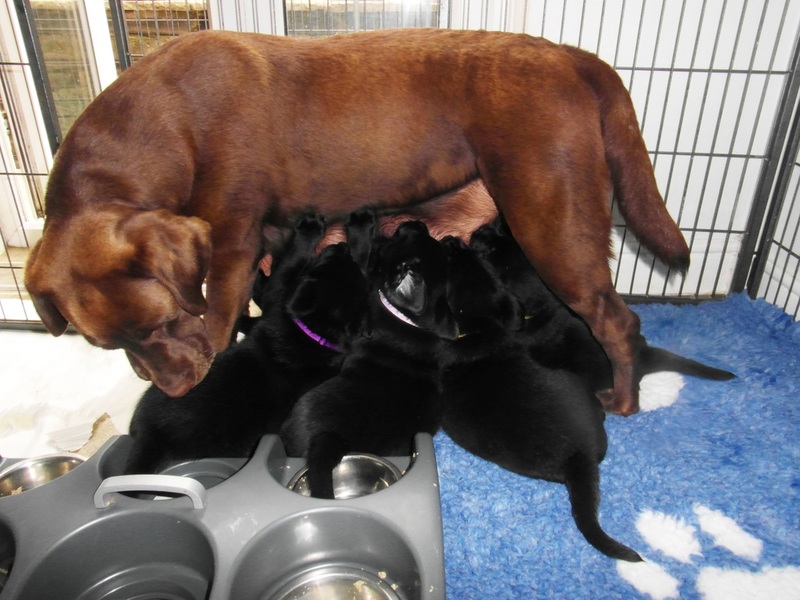 Annie finished off the puppies' food so I decided to give her her midday meal while she was still in the pen. The puppies decided that as Annie had eaten some of their food, they were going to eat some of hers. Annie, being the devoted mum she is, sat back and let them tuck in. A couple of videos of the puppies playing today. 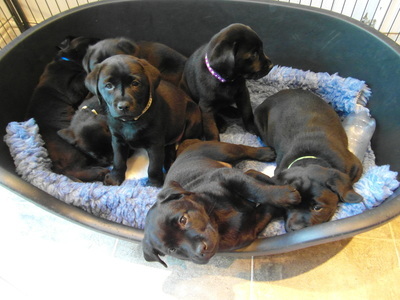 Click here and here to watch them. 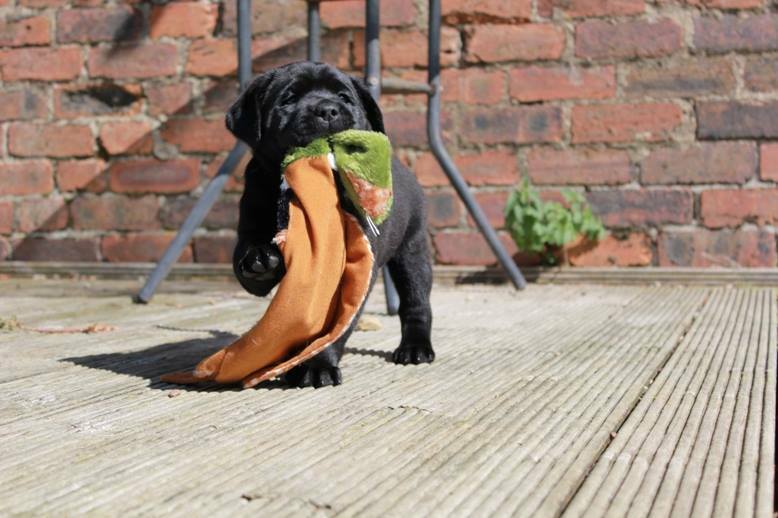 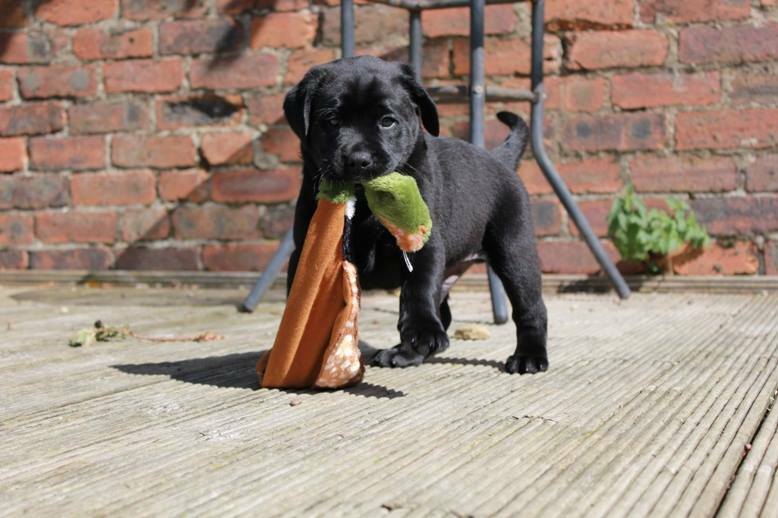 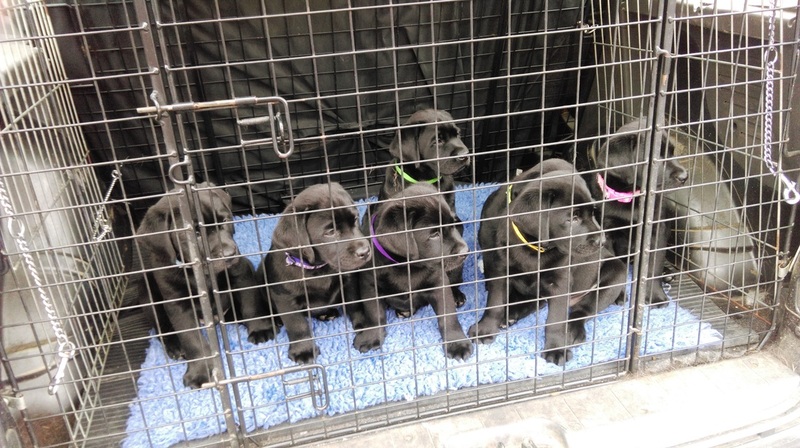 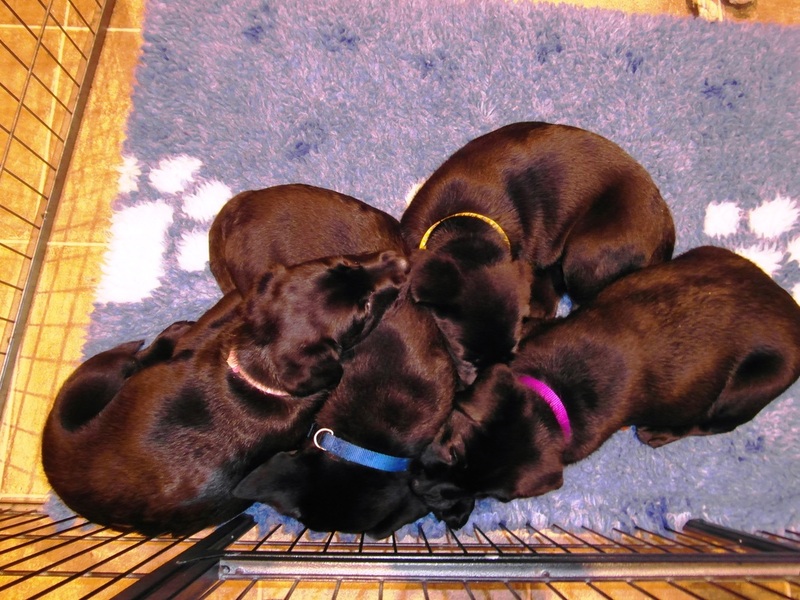 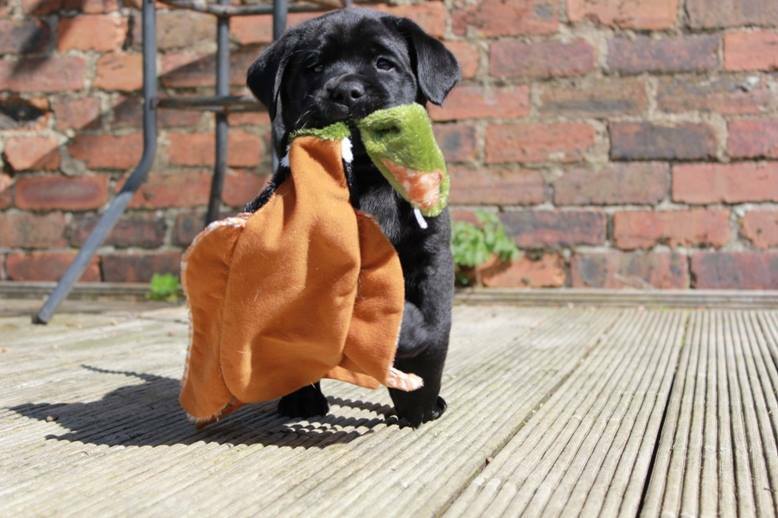 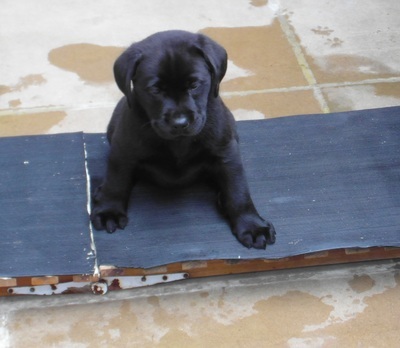 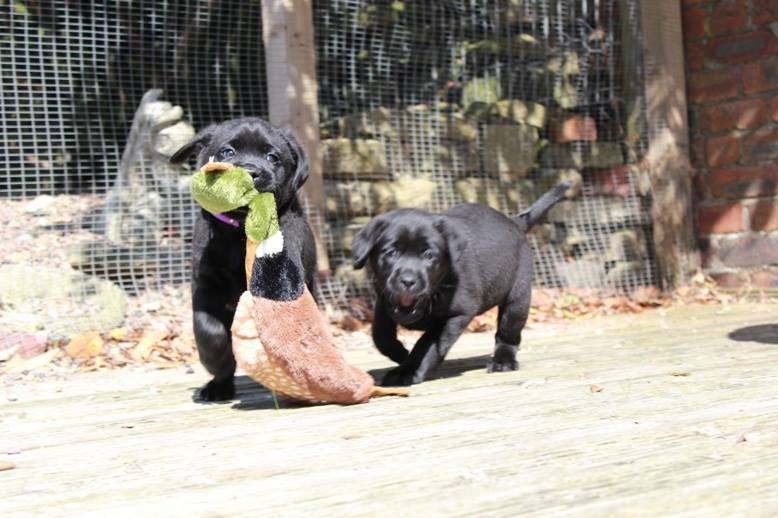 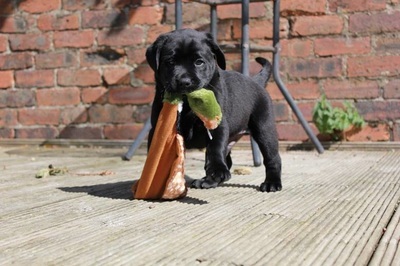 Watch the puppies in this video, retrievers doing what they do best, retrieving. 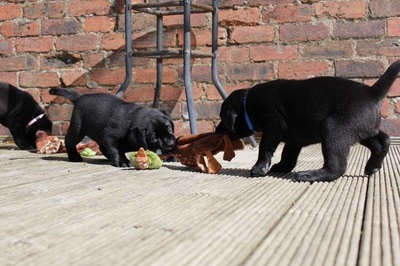 The puppies and their first toys. Please excuse the pile of poo at the edge of the pen, some sneaky little beggar did it while my back was turned, switching on the camera. In this 2nd video you can see Ned in with the puppies, he's so gentle, despite them trying to bite him. 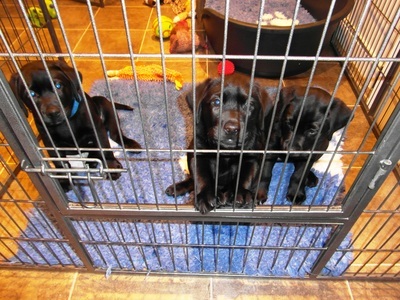 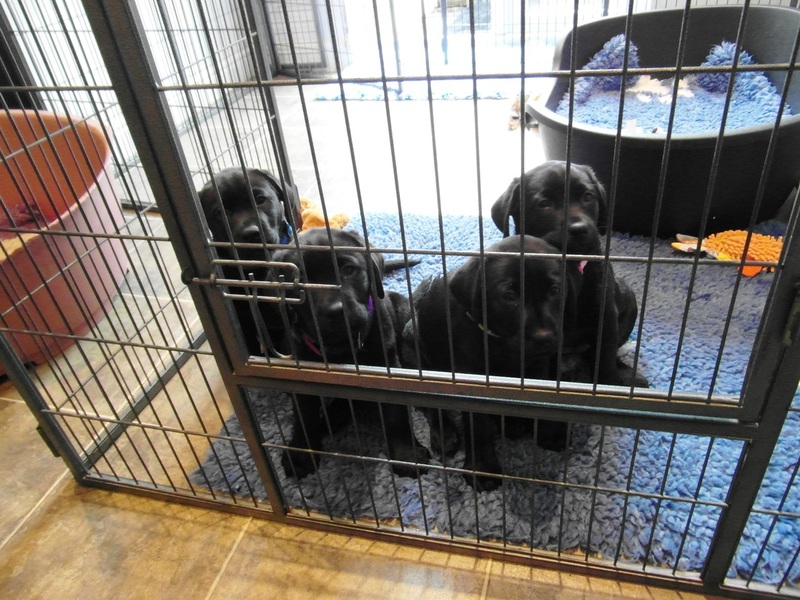 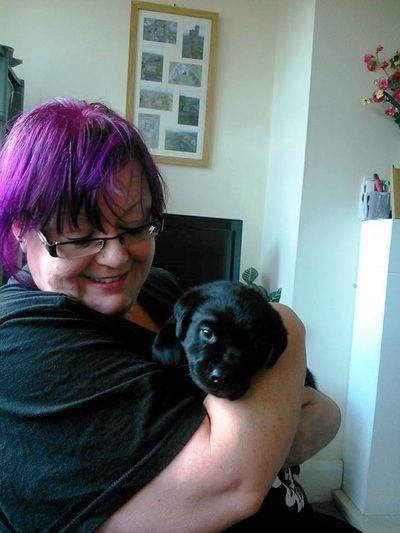 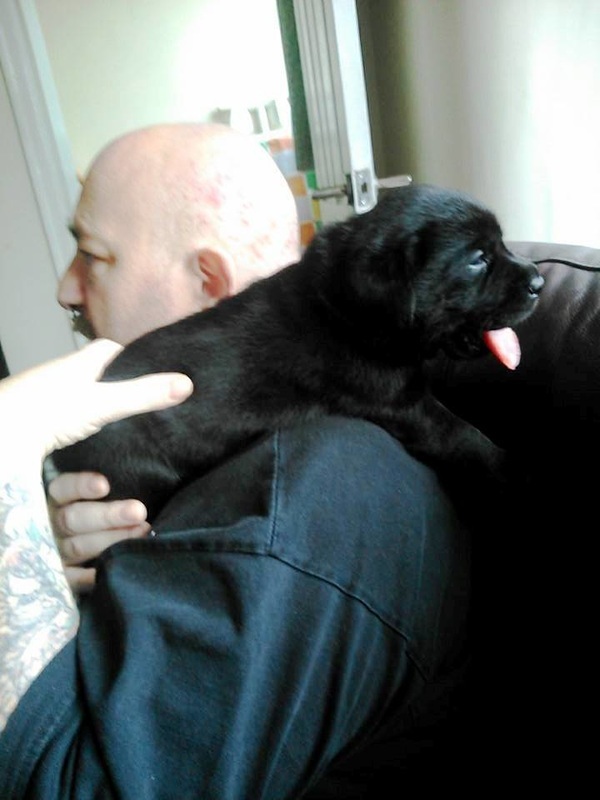 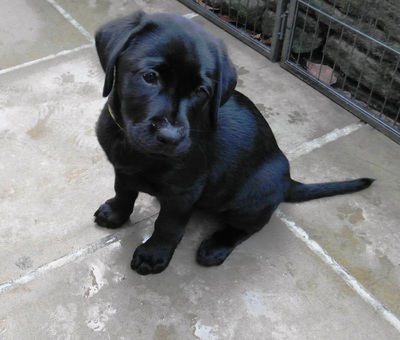 The puppies have had lots of visitors over the past few days, some of them new owners, some of them friends. 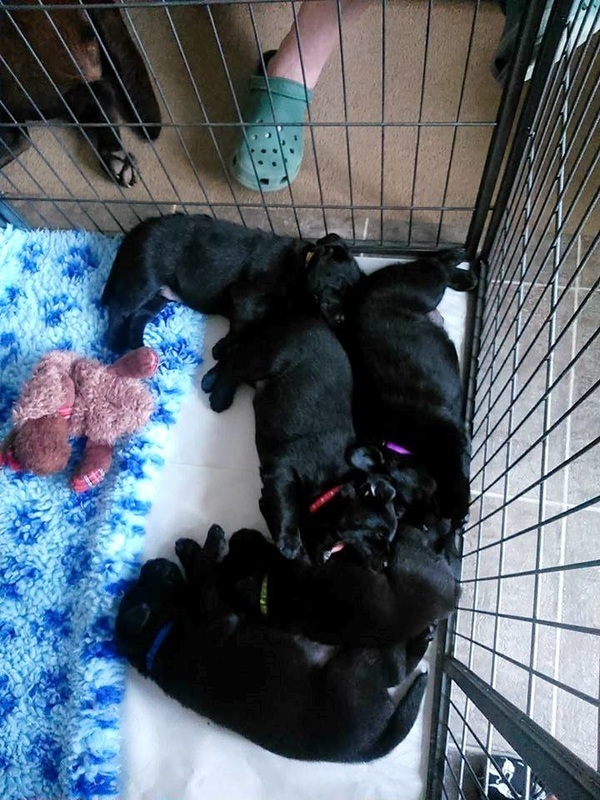 Here are a couple of the puppies getting cuddles from my friends Mary and Graham and one of some of them snoozing after the excitement. 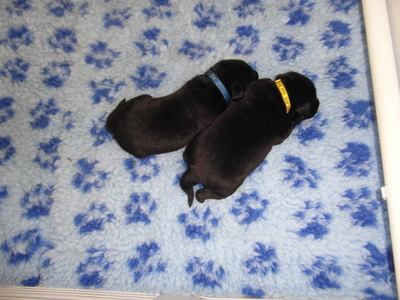 A couple more videos of the puppies, taken today. 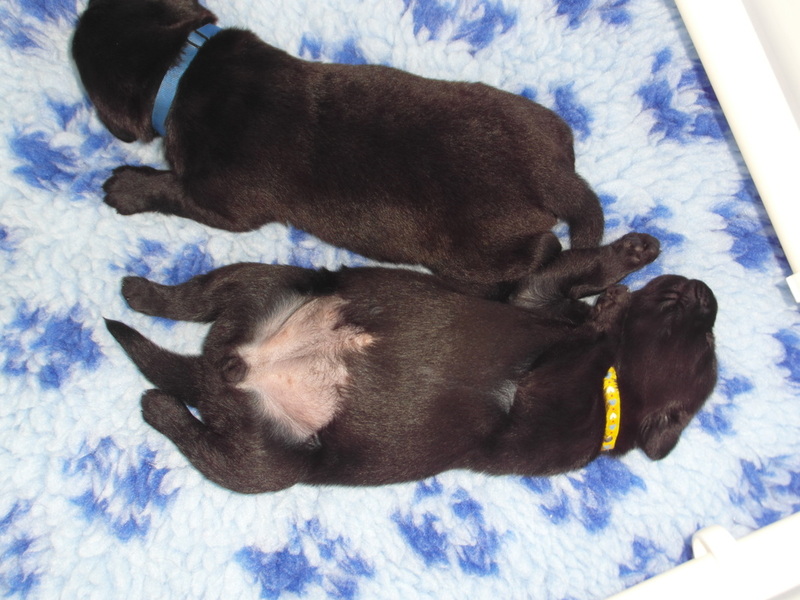 They both show how all puppies soon respond to the universal call of "Puppies". 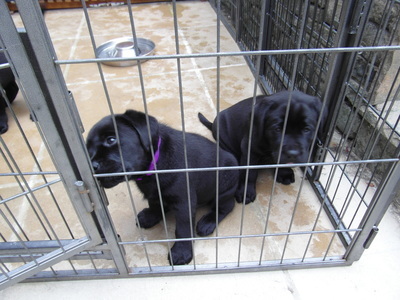 VIDEO 1 and VIDEO 2. Below are a some photos taken at the same time. 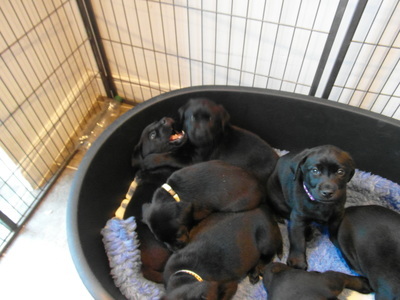 In the right hand photo I think someone's told a very funny joke to the girl with the yellow collar. 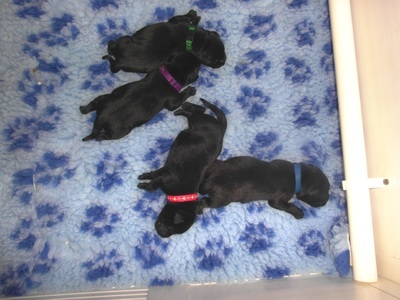 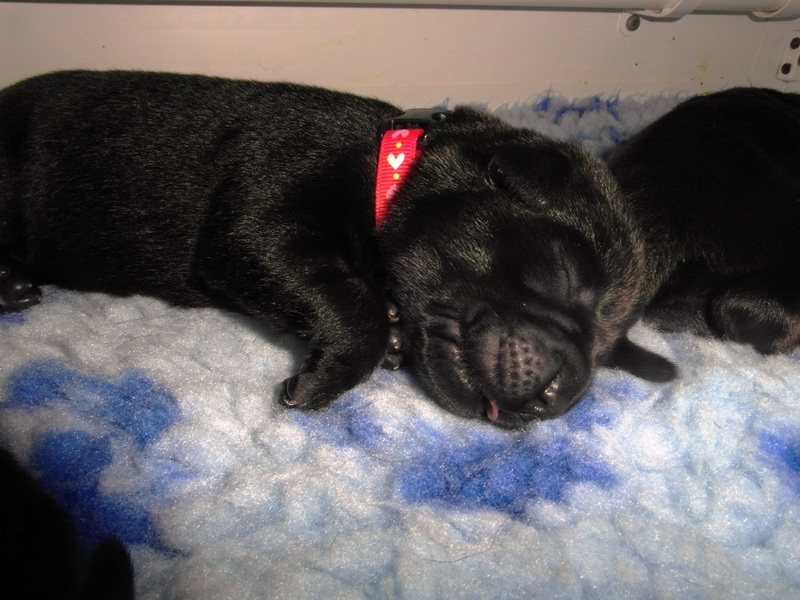 The puppies are exactly a month old today - how time flies. 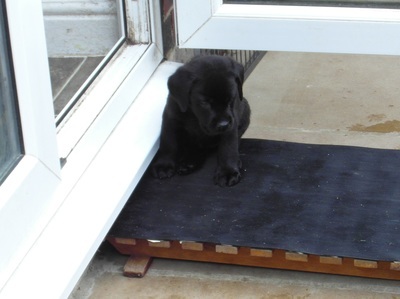 Preparations are in hand to move them from the living room through to the dining room, where they'll then have access to the outside. 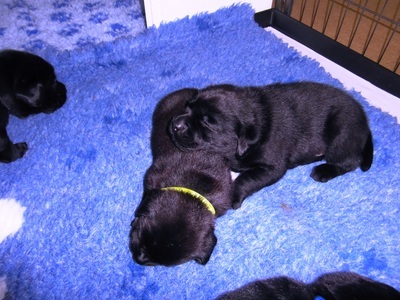 The smallest girl using her brother for a pillow. 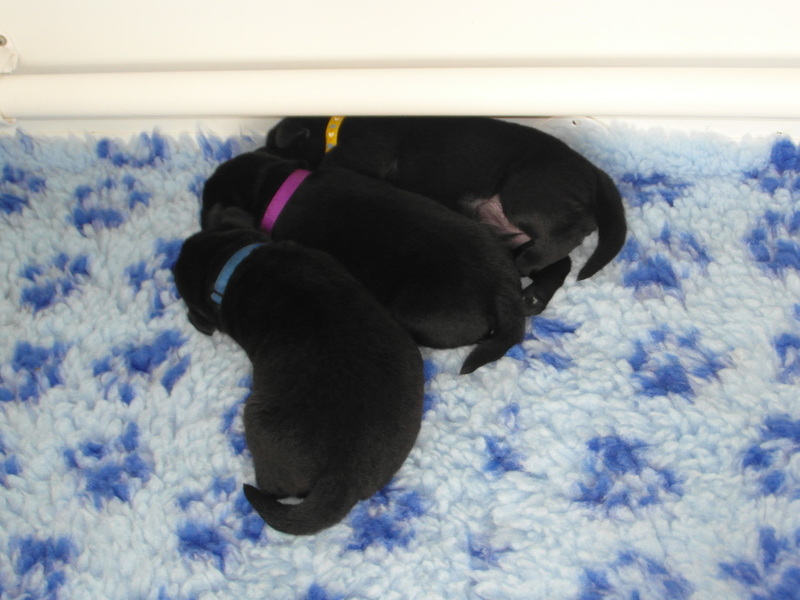 "No, she might be the same colour, but she's not our mum"
The pups have been on the move today. 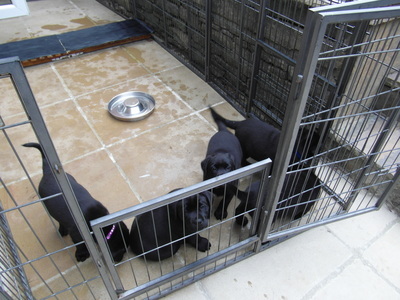 They have a new pen set up in the dining room and access to the patio. Here you can watch them playing. 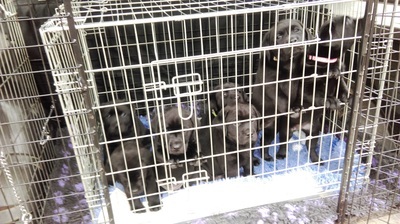 If it's fine tomorrow they'll be able out go outside for the first time. 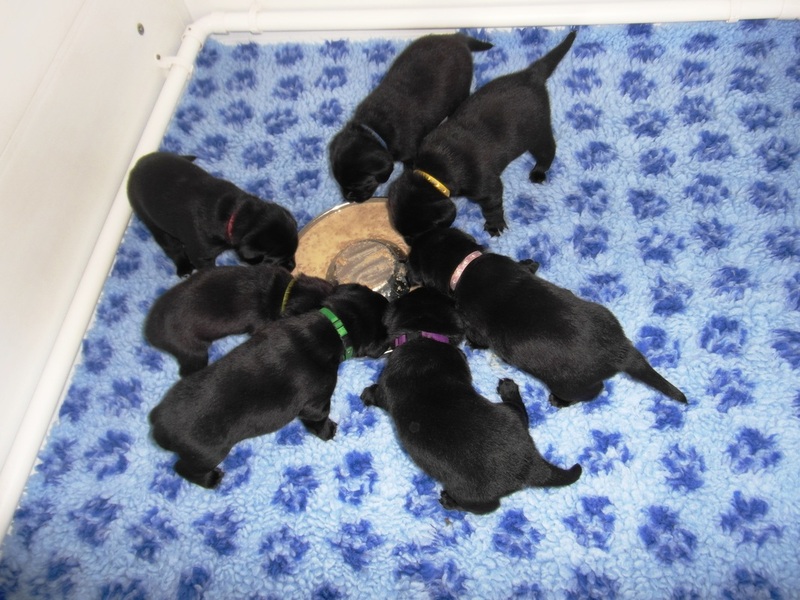 The puppies are now feeding from individual bowls rather than the one circular one. 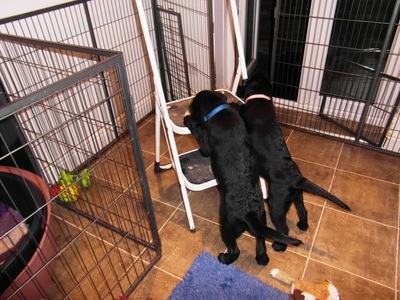 There was a bit of swapping around but they soon got the hang of it. Eating nicely in the first picture but a little bit of climbing/swapping going on in the second one. 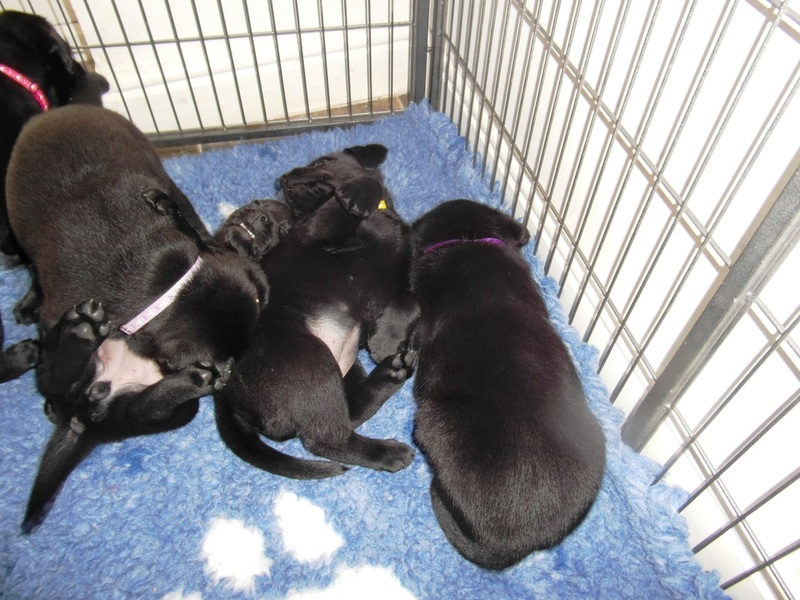 A bit of post tea rough and tumble in the first photo and poor long-suffering Annie giving them a top-up in the second one. 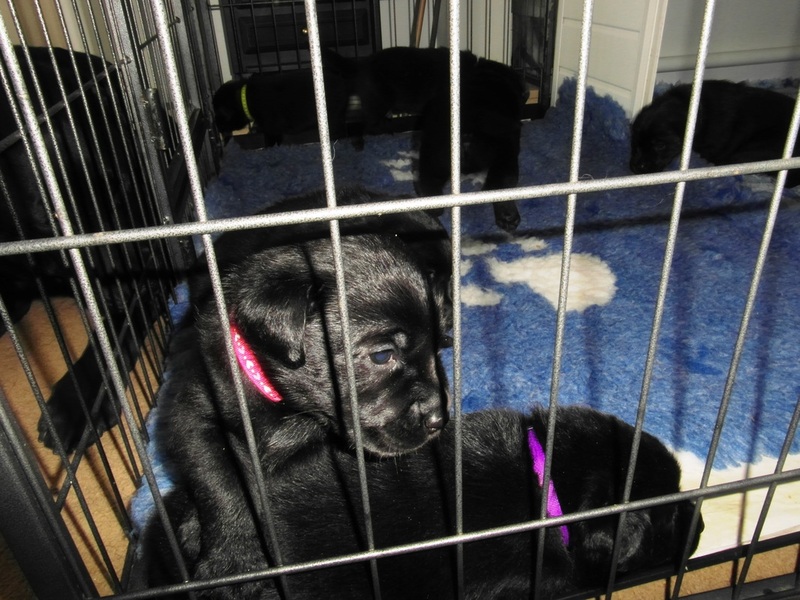 A few photos taken of the puppies before they settle down for the night. 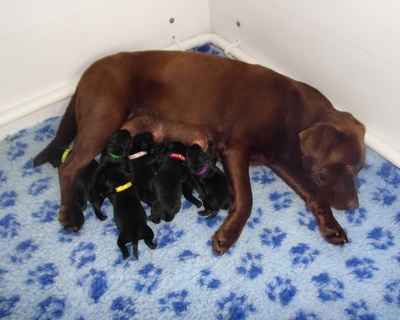 Annie had just been in to give them a quick drink and some of them have milk on their heads. 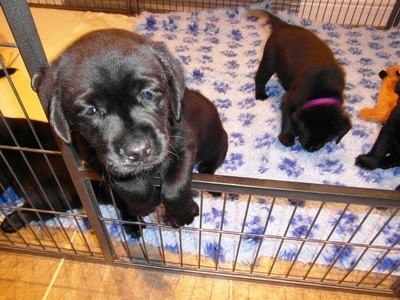 Uncle Ned risking life and limb to sit in with the puppies. 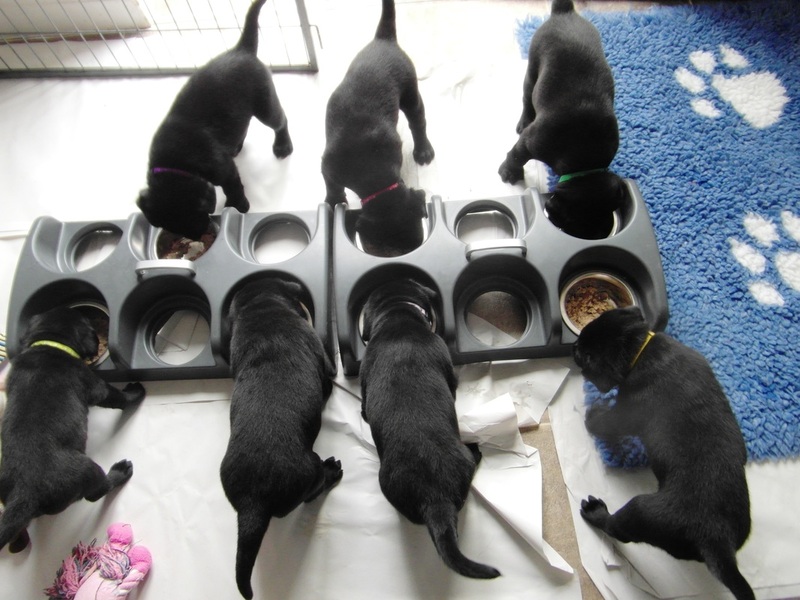 The puppies chop and change with the food bowls so I've been filling all 12 bowls and letting them choose which to eat from. In this VIDEO you can see the mayhem after they're eaten, particularly from the girl with the pink collar, who thinks carrying bowls around is a great game - has Auntie Gertie been giving her lessons? 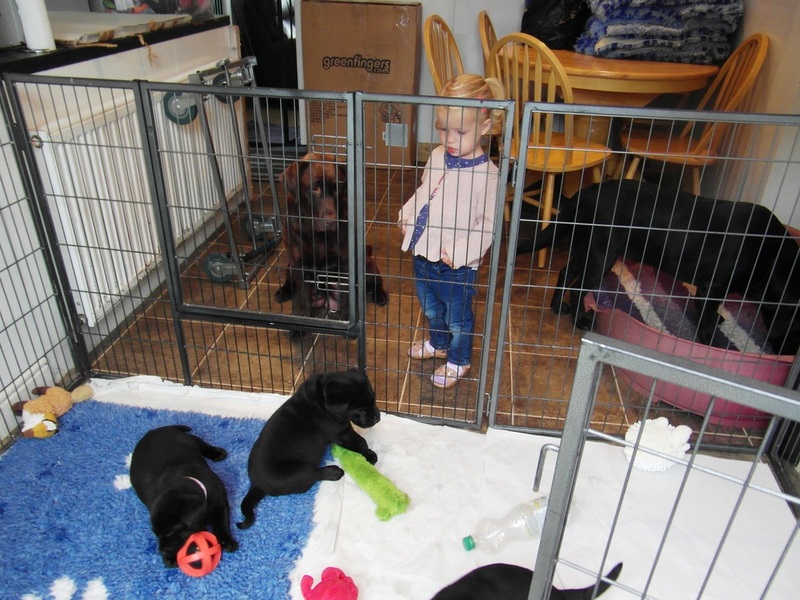 Two year old Isla wanted to go into the pen with the puppies but they're far too rough, so she had to make do with looking at them from the outside. 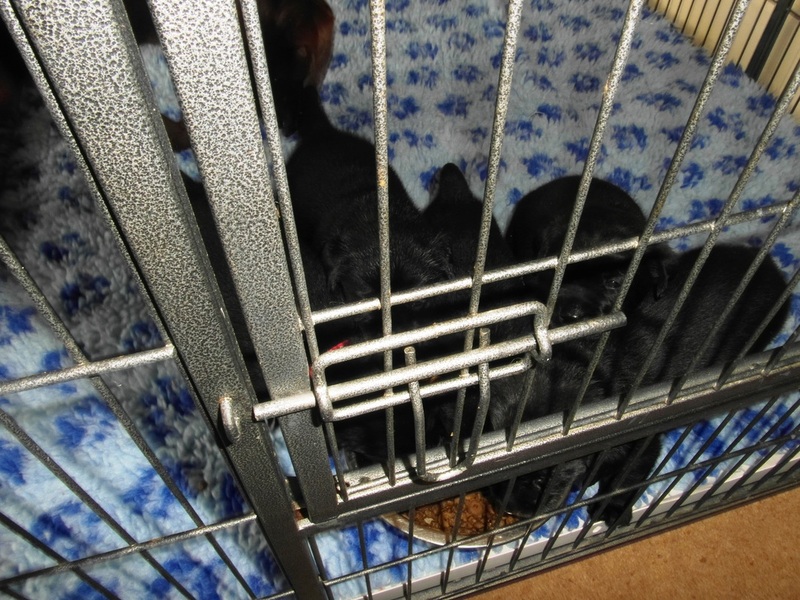 All snuggled up after having their breakfast. 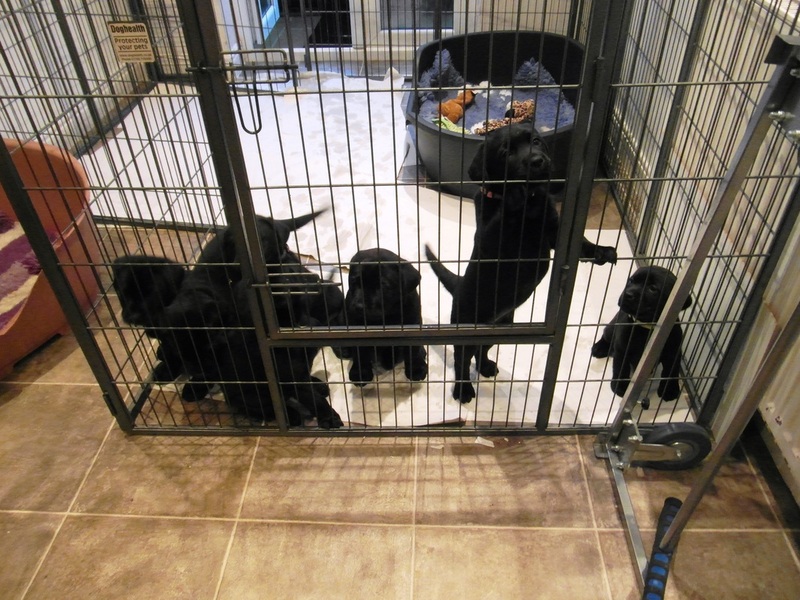 The puppies had a free run of the kitchen while I was cleaning out their pen this morning. 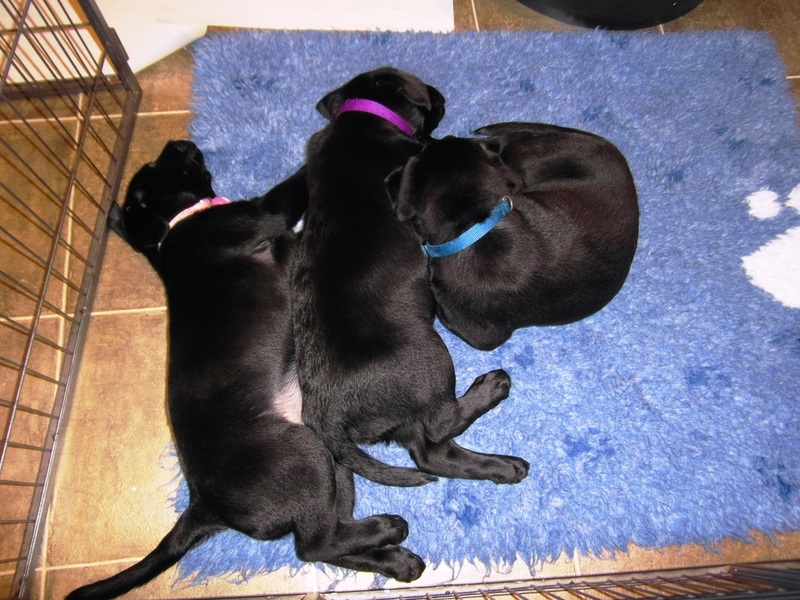 They tried out one of the big dogs' beds, so I decided to give them one of their own. A few photos taken today by my very good friend, Joanne Elrod. 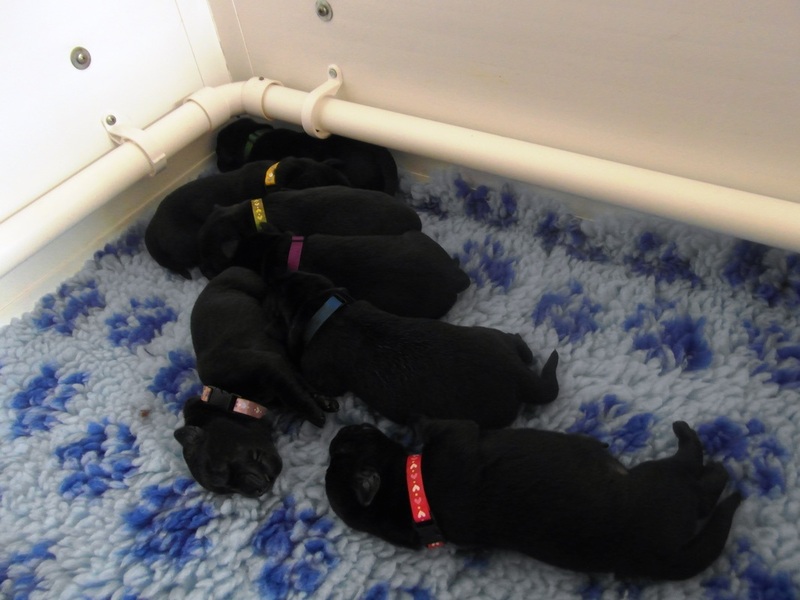 Some of the puppies were asleep so aren't amongst these. 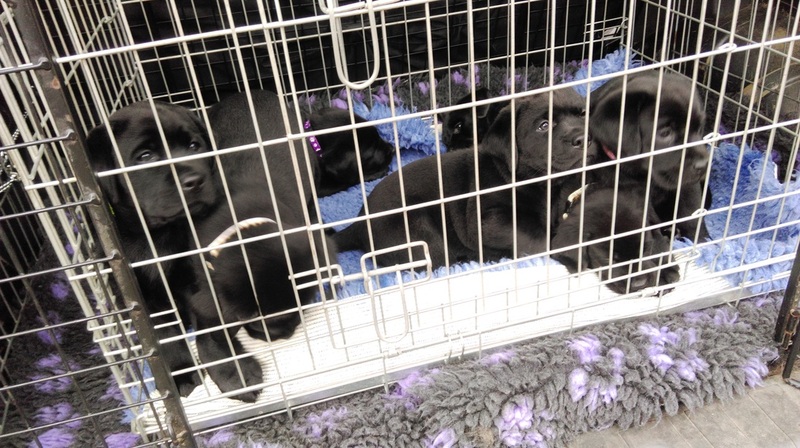 The puppies have been out in the car this afternoon. They settled down quite quickly and fell asleep after a few minutes. 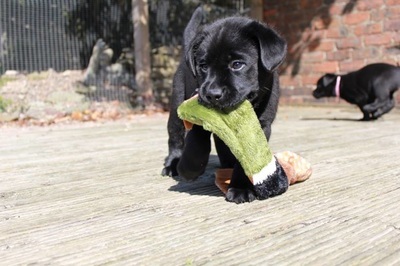 A few of today's photos. There seem to be more and more out-takes as the puppies move around so quickly. 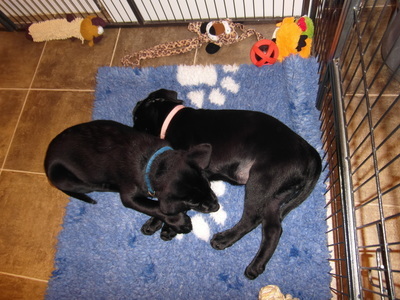 The puppies were about to settle down for a nap until I got the camera out. 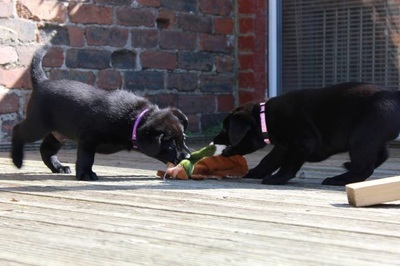 The puppies have so much energy, especially first thing in a morning. 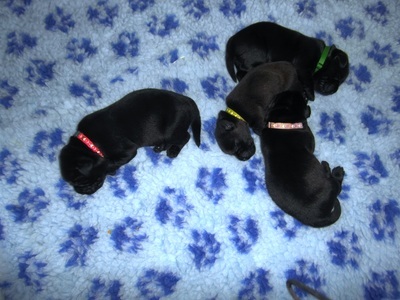 WATCH them in this video, taken at 7am. 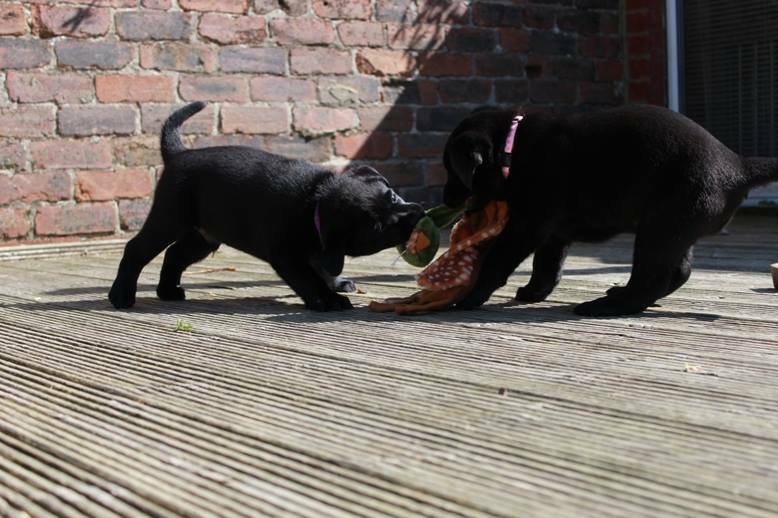 A couple of videos from today. 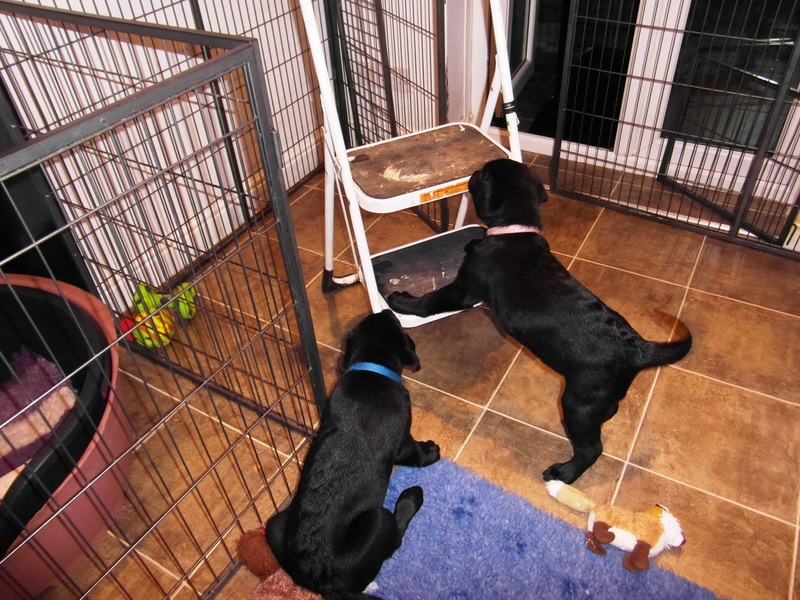 The first one shows the puppies' reaction to the vacuum cleaner. I've been lucky with the weather up to now and the puppies have been able to go outside while I've been cleaning their pen, but today it's been pouring down and I've had to revert to plan B, the plastic puppy pen. 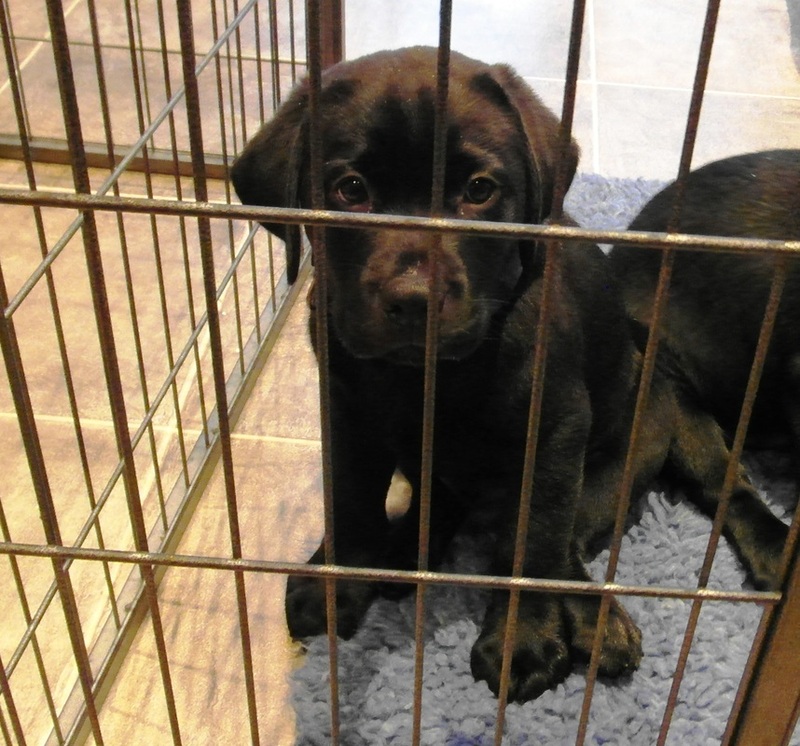 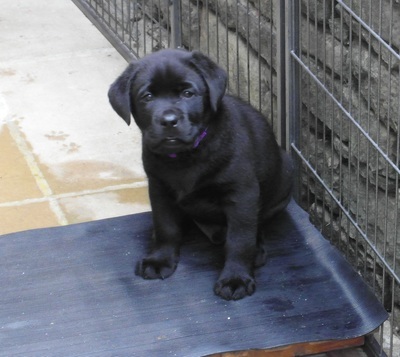 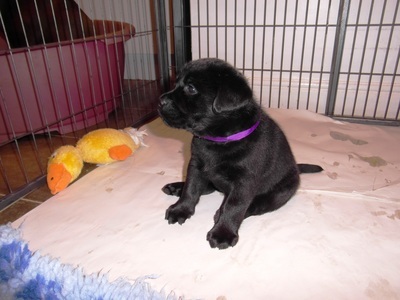 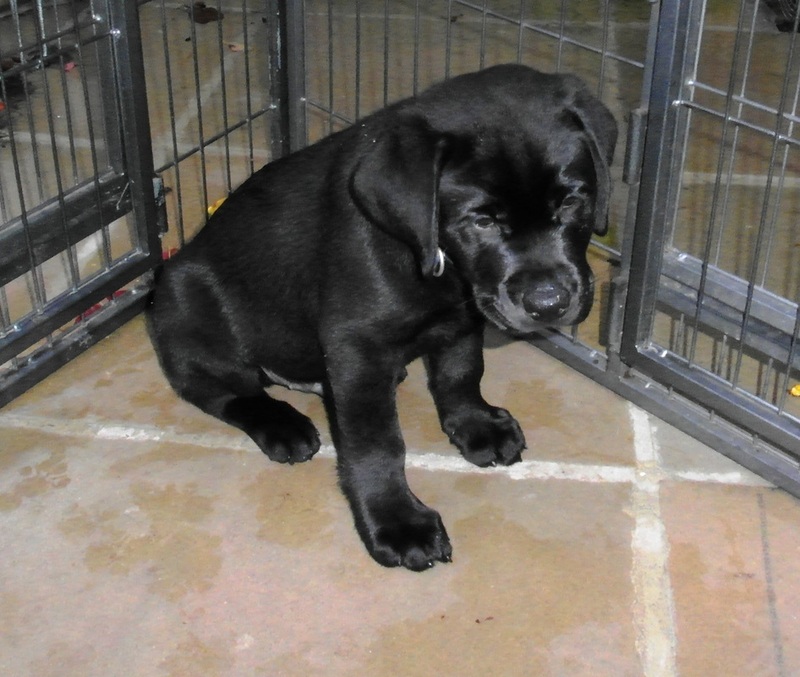 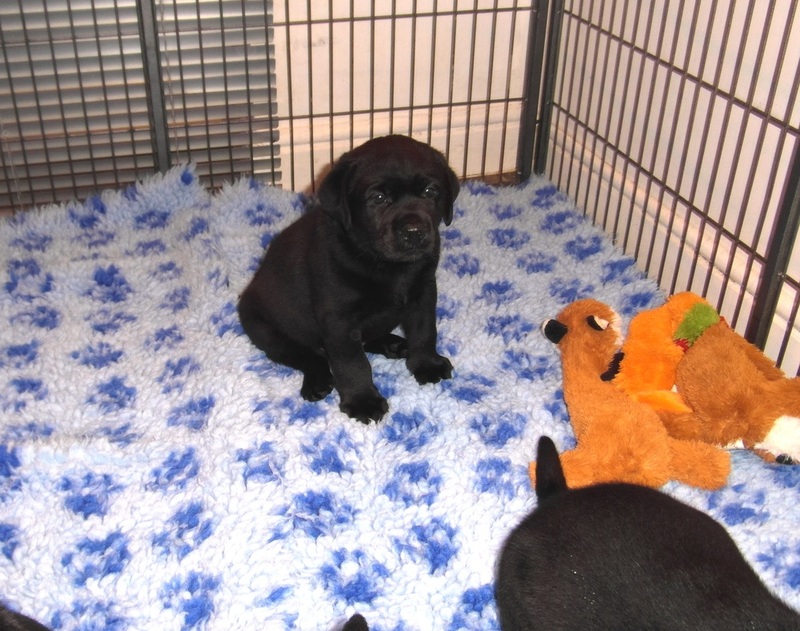 As you'll see in this second video, as they move it around the kitchen, plastic puppy pens aren't such a good idea for Labrador puppies. 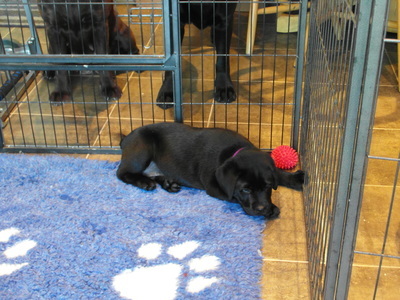 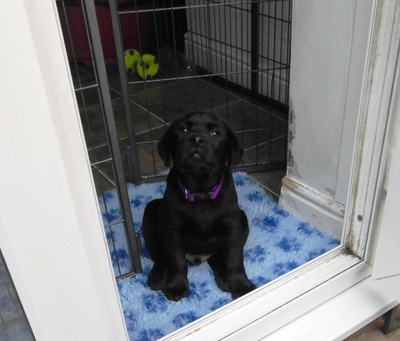 Another wet and miserable day so the puppies have spent most of their time inside. They tend to get rather rowdy at times, as you can see in this VIDEO. 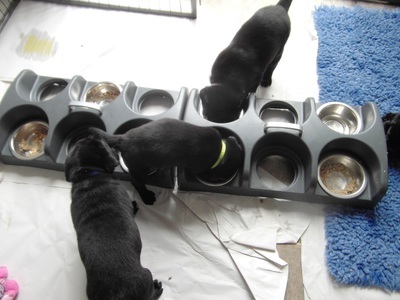 A week ago I changed their ID collars over to the quick release cat collars, it seemed like a good idea at the time, but the little beggars keep pulling them off and chewing the clasps, so I've had to revert to the ID collars. 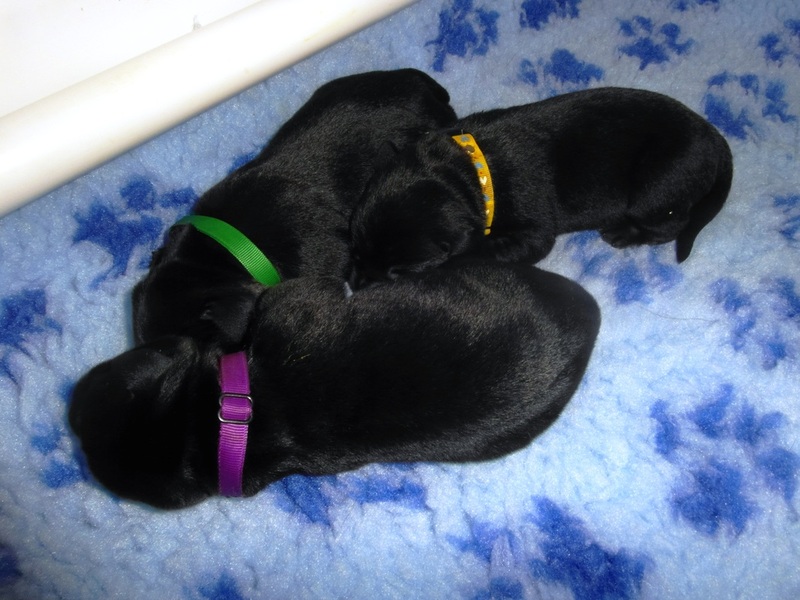 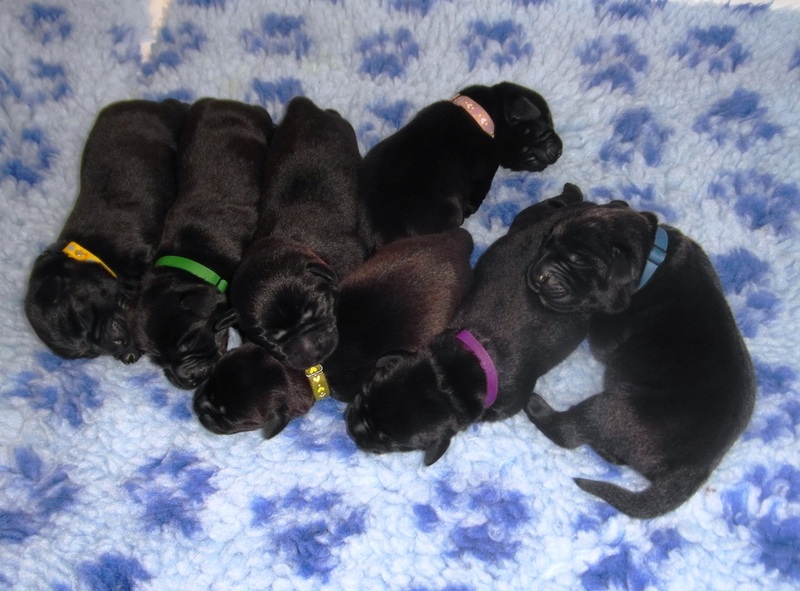 The puppy in the video who looks as though he's wearing a dark pink collar is actually wearing the purple one. One of the few times when there's peace and quiet. The puppies have been to the vets for a check-up and microchipping today. 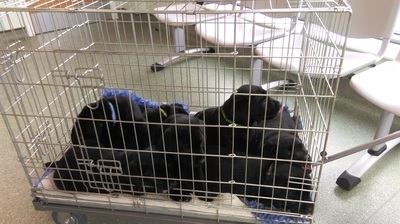 No photos of them in the car when we arrived at the vets as they had covered both the car and themselves in poo! In the crate in the waiting room. They had lots of attention despite still being rather whiffy. 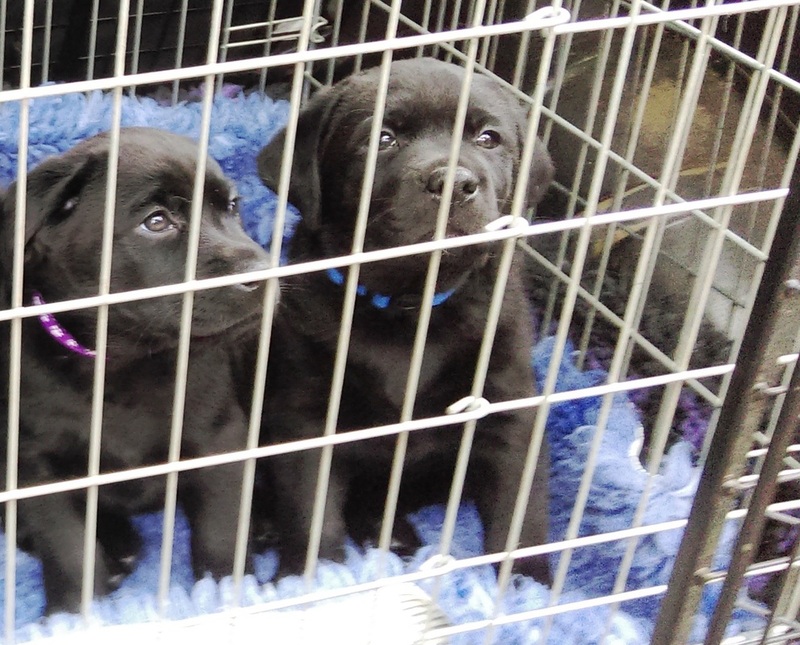 Back in the car (with fresh bedding) and ready for home. 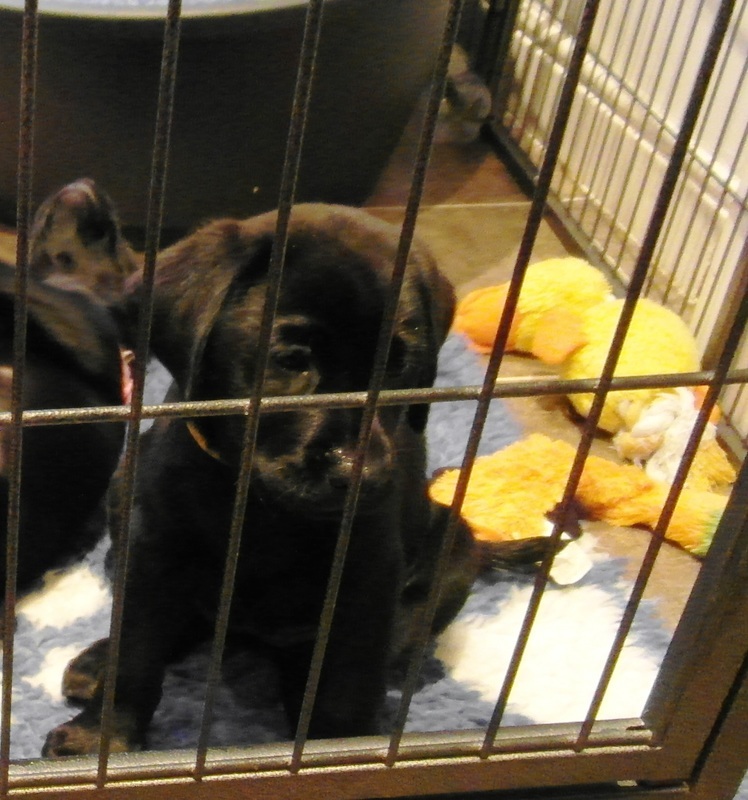 A final VIDEO of the puppies together before they start to leave for their new homes tomorrow. 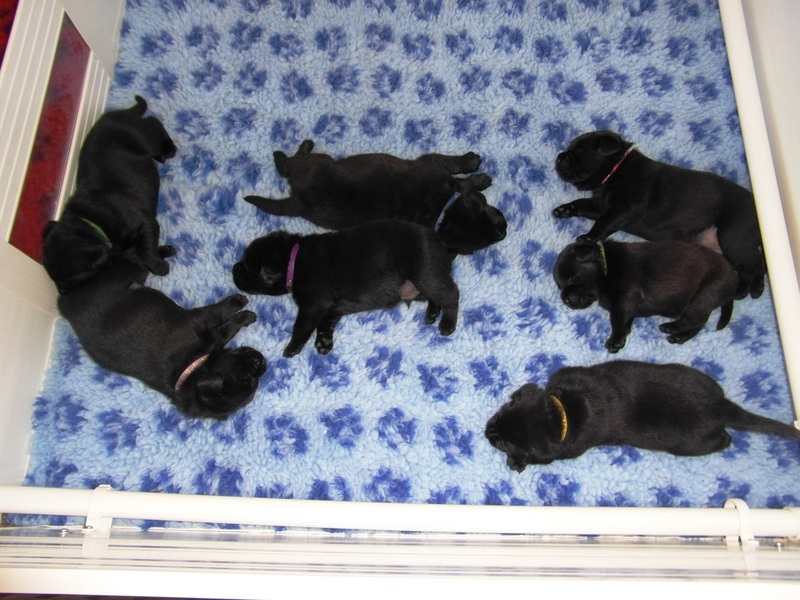 ...... and then there were five. 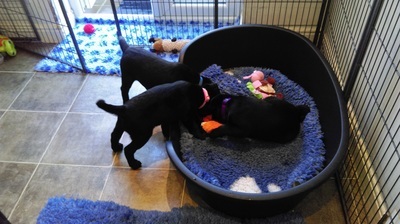 Two of the girls have gone to their new homes today, here are the remaining 5 tucking into their tea. Standing on the stepladder so I could replace a lightbulb, I looked down and saw these little 'helpers'. Another puppy went to his new home today so there are just these 4 left. 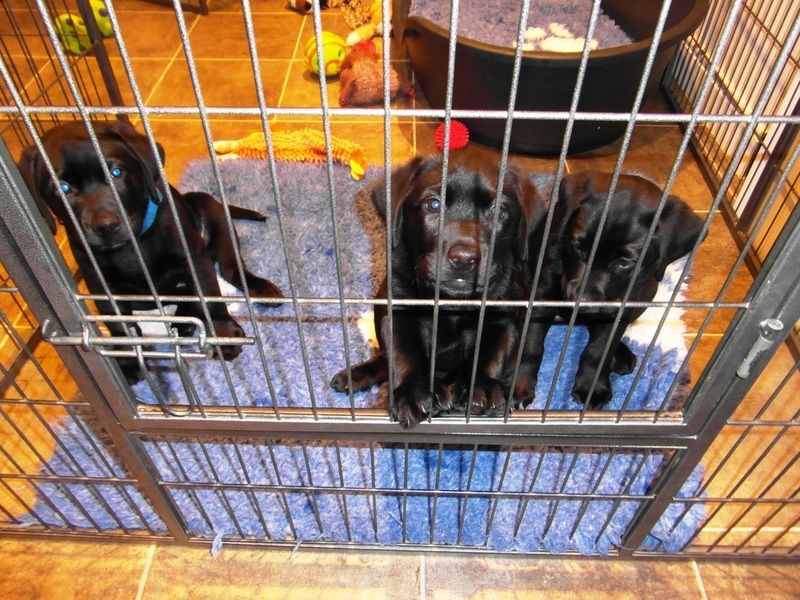 From L to R Boris, Monty, Rosie and Esther - partners in crime. 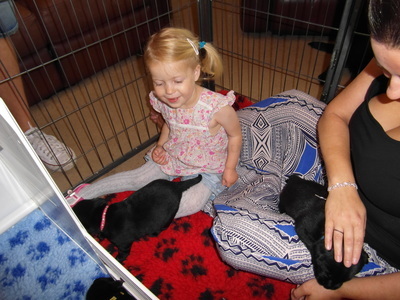 multi-tasking as she takes a phone call while giving Rosie cuddles. 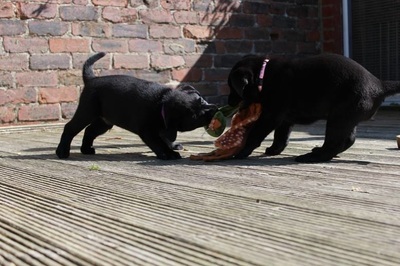 A couple of today's photos. The puppies move around so quickly it's often difficult to get them all in focus. 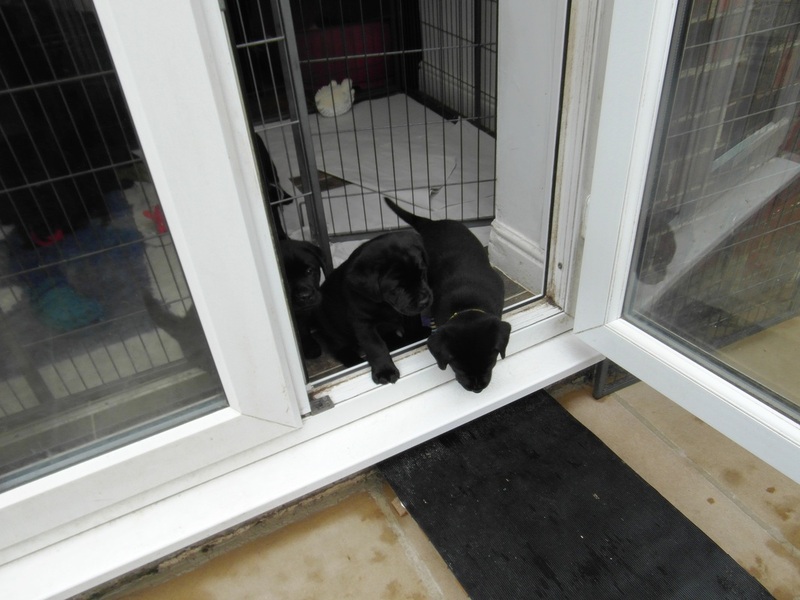 There's been a lot of heavy rain today so the puppies haven't been outside much. 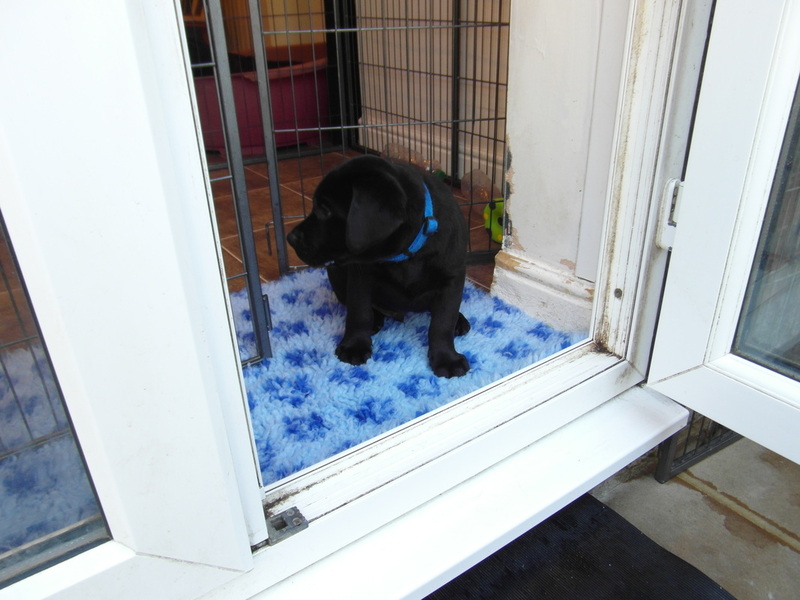 These photos were taken this evening, just before it started to get dark. The final night together for these 4 puppies before Rosie leaves for her new home tomorrow. 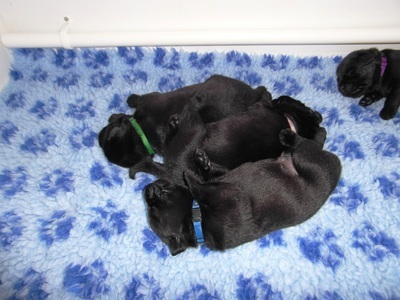 Here they are having a cuddle together. 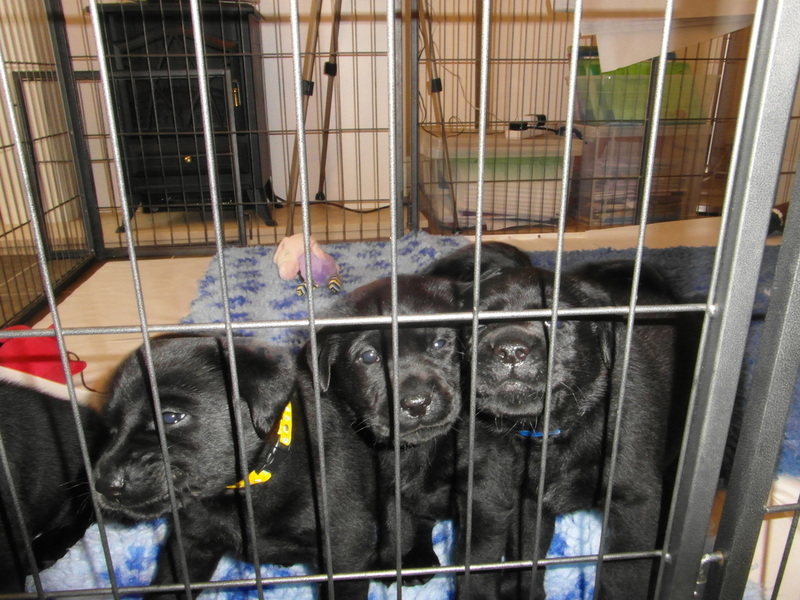 The three musketeers, Boris, Monty and Esther. 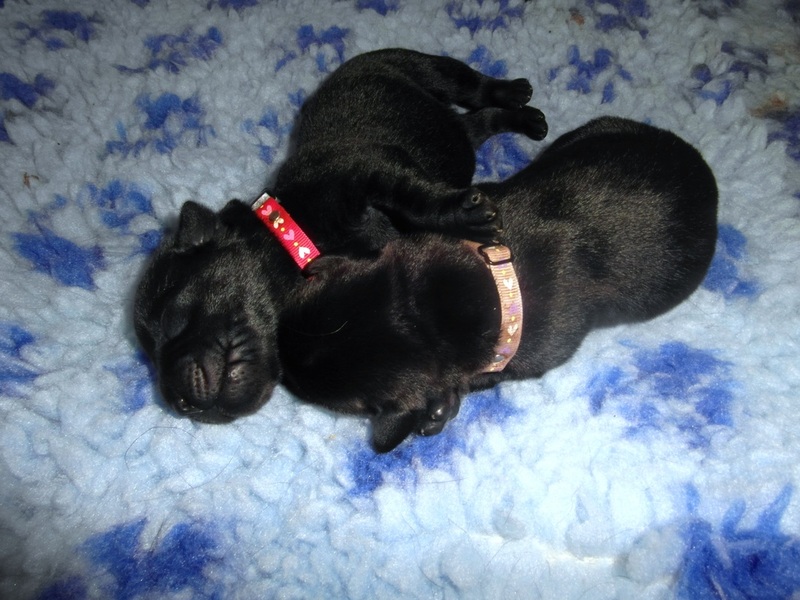 In the first photo they're far from ready to settle down for the night, in the second one they've finally given in and are snuggled up together. A short VIDEO of the 3 pups playing together. It's a tough life when you're a puppy and sometimes all you need is a snooze. Their last supper together before Monty leaves for his new home tomorrow. 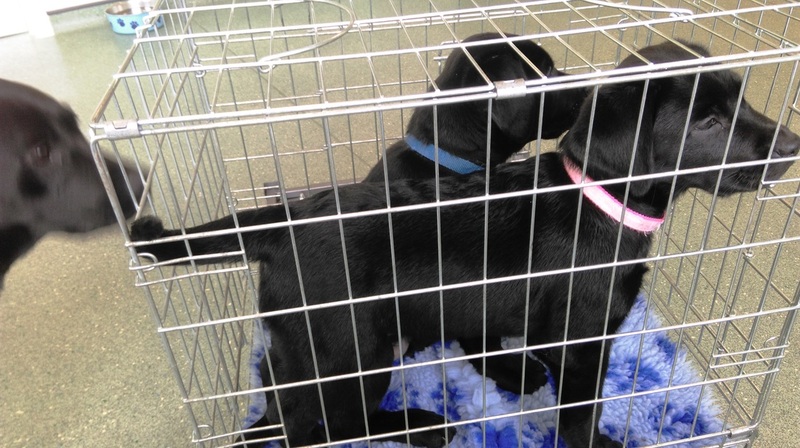 Boris and Esther have been for their second vaccinations today. 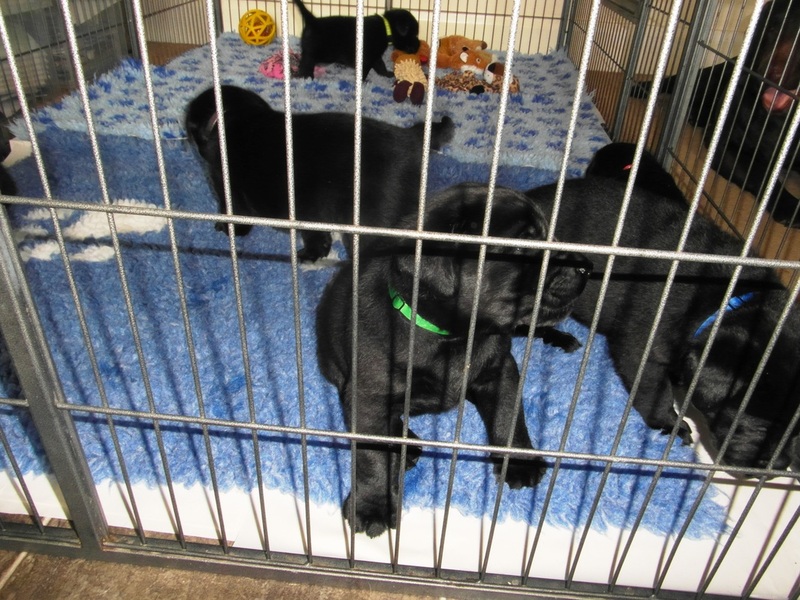 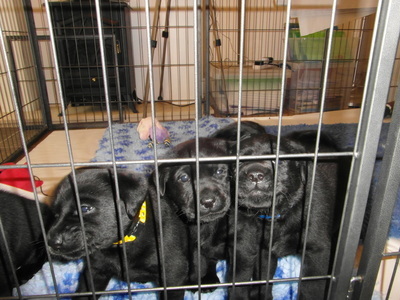 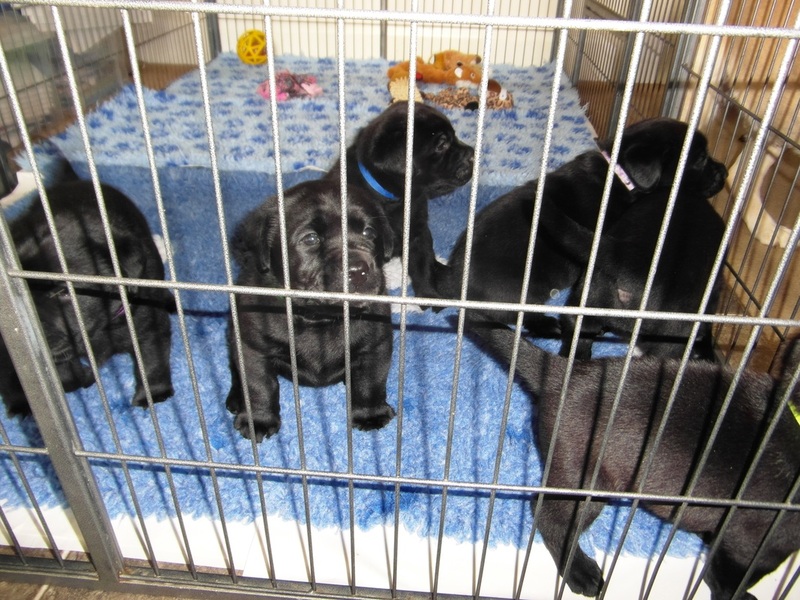 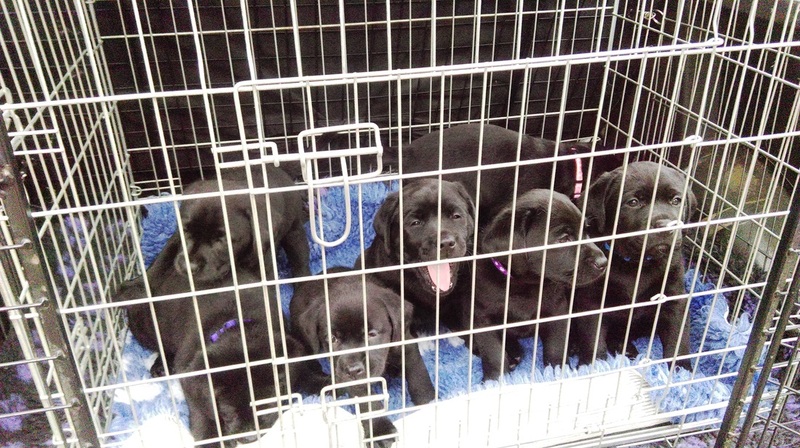 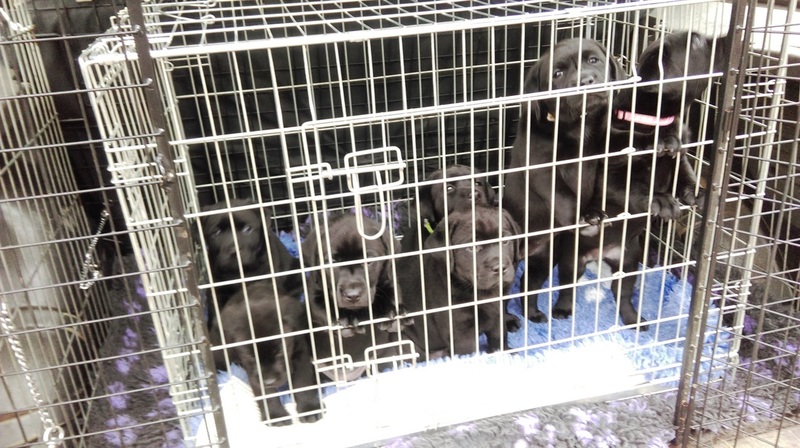 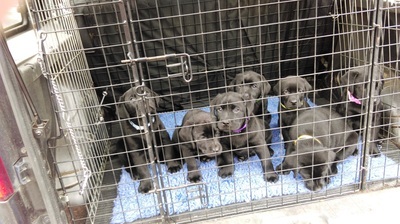 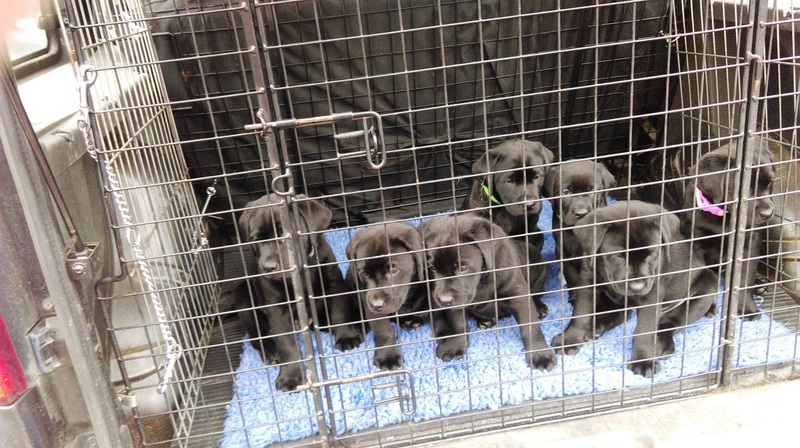 Here they are in the crate, having a nosey around the waiting area. 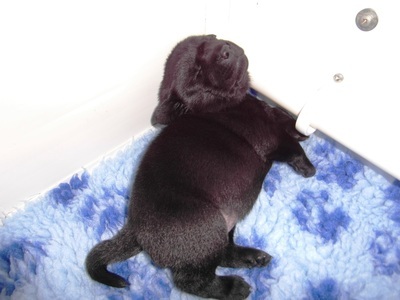 "Do you need help with changing that light bulb? We'll give you a hand with the steps." A couple of photos of Boris and Esther together before Boris leaves for his new home tomorrow.